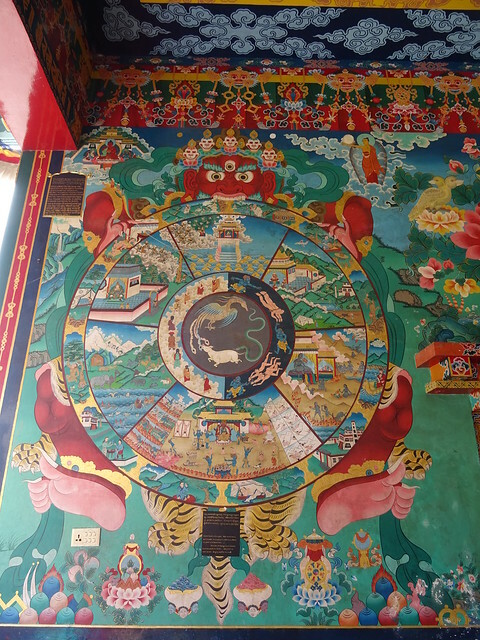 Returning to the city from Lukla was a little of a culture shock. 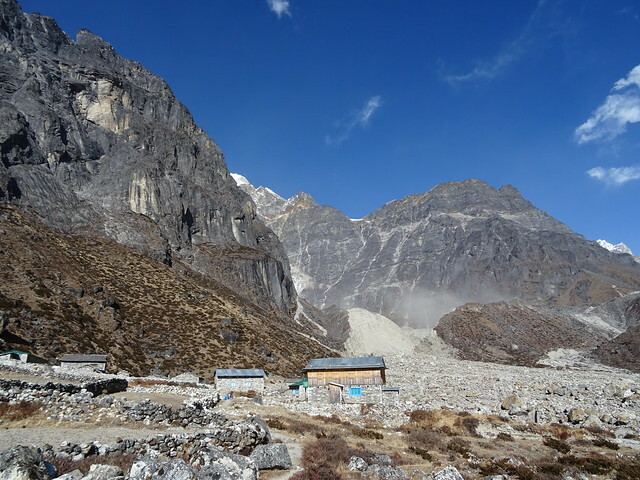 Swapping very basic wooden lodges with plastic sheet windows and long drop toilets in quiet valleys, for a plush hotel in Kathmandu with (relatively) endless hot water and busy traffic outside. 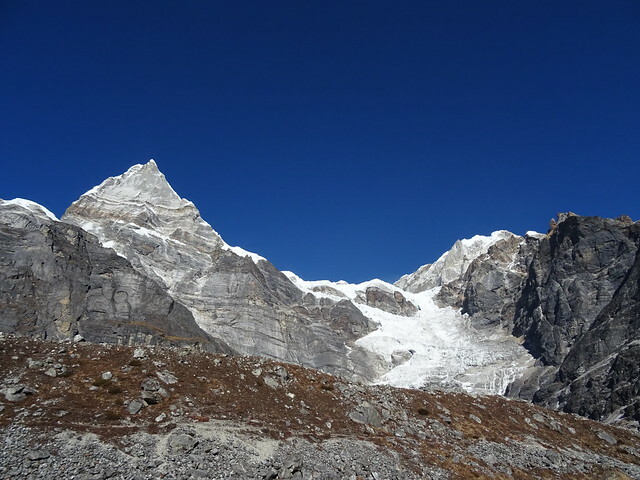 Swapping freezing at night in a sleeping bag clutching a hotwater bottle, for sprawling out on a bed under clean sheets with the air conditioning on. 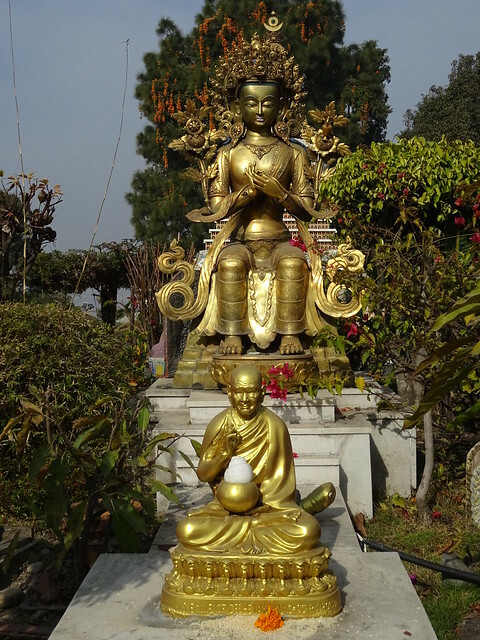 And while I celebrated New Year’s Eve in Thamel with cocktails and dancing in the street in the dark amidst the crowds, the following morning I had to remove myself to find peace and tranquillity like I had in the Hinku valley – as close as I could find. 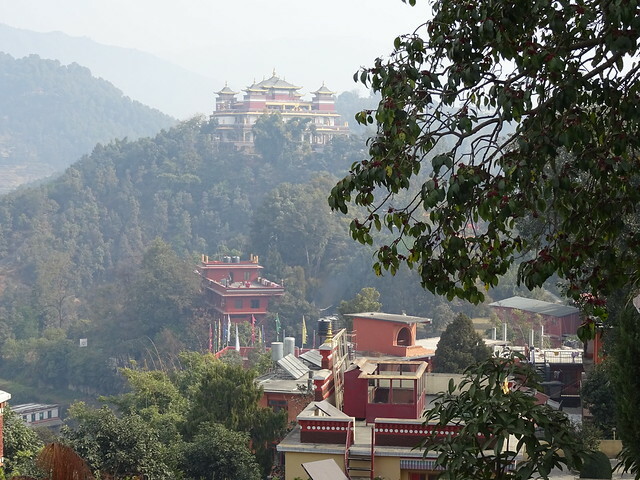 I couldn’t face the walk through busy streets from Boudha stupa so I negotiated a taxi to Kopan monastery and had a few hours of quiet bliss overlooking the city. 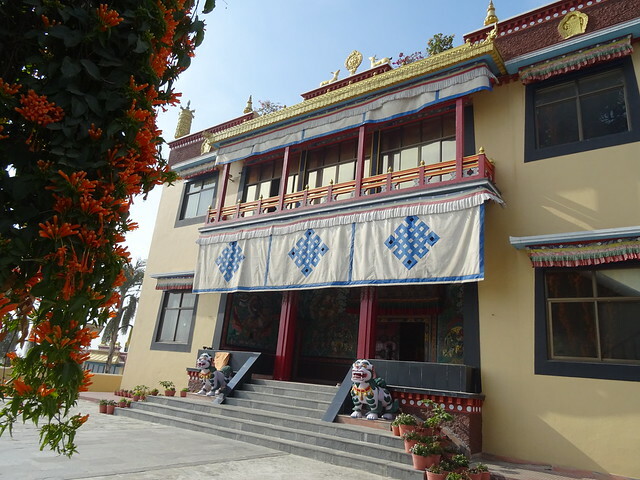 Kopan monastery caters for westerns keen for retreats as well as training local Buddhist monks. 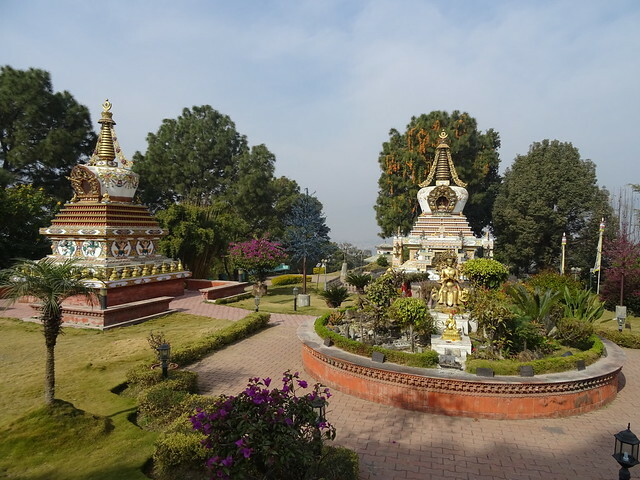 In its grounds you can wander round stupas and admire the gardens. It turned out to be a perfect way to relax. 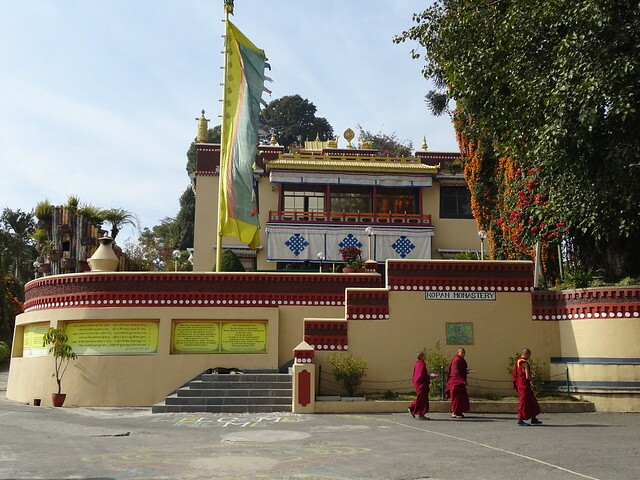 Just down the road is the Kopan nunnery and while I could sneak in through the gate, the nuns were all out having lunch in the sunshine so the monastery wasn’t open. 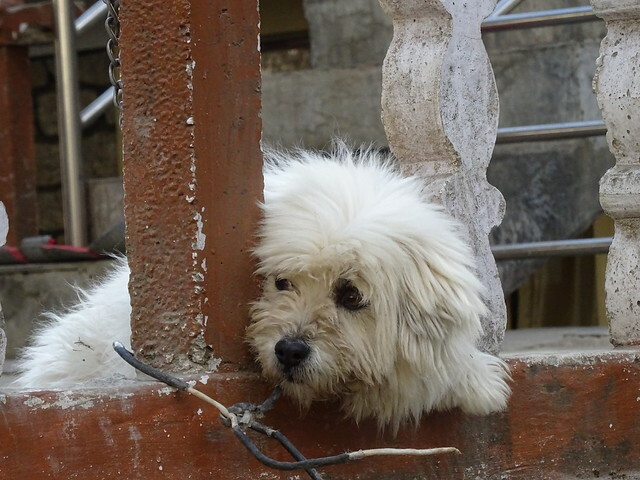 Three dogs greeted me with barks as I approached the building and on realising I wasn’t the enemy they circled for attention. 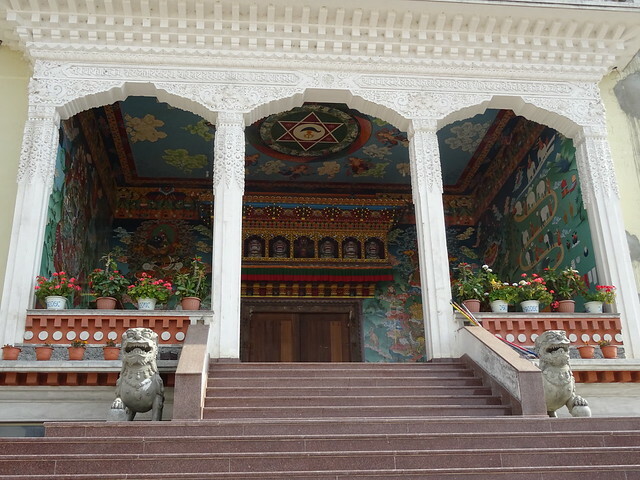 The nuns were incredibly generous and offered me to join them for lunch, it felt rude to decline but I’d already eaten at the main monastery cafe. 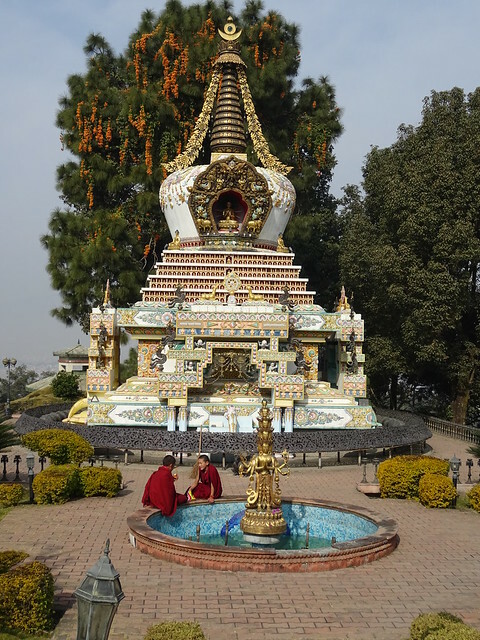 It’s a shame the nunnery clearly does not have as much spent on it as the monastery and I suspect it doesn’t get as many visitors, even in Buddhism Nepal isn’t equal across society. 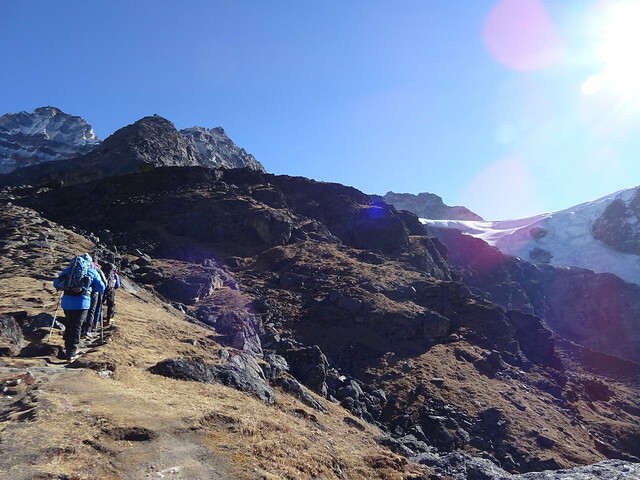 After a rest day we started our descent out of Khare and back towards Lukla. 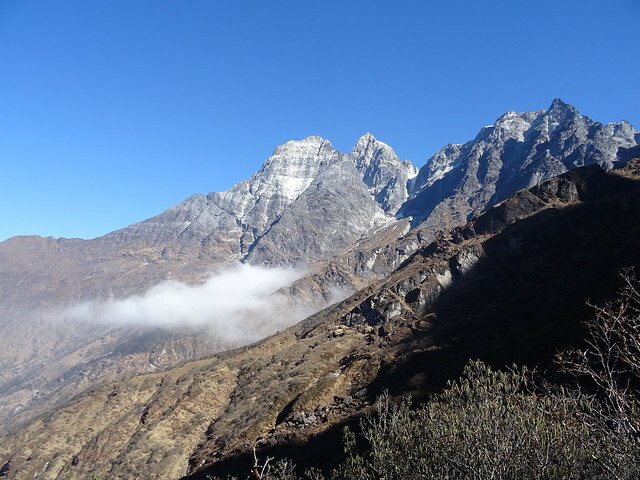 Whilst we were starting on the home straight none of us imagined that it was going to be plain sailing back to Lukla – we still had to ascent back up to the Zatrwa La first. 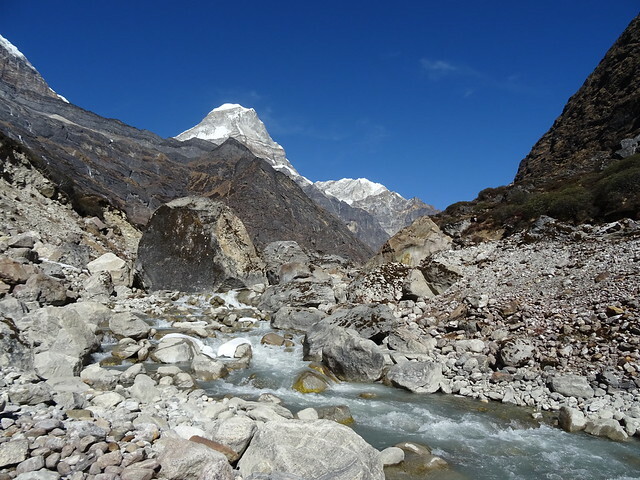 It was certainly quick going though back down the valley from Khare, managing to get back to Gotay in a day – a route that had previously taken us 2 days to walk. 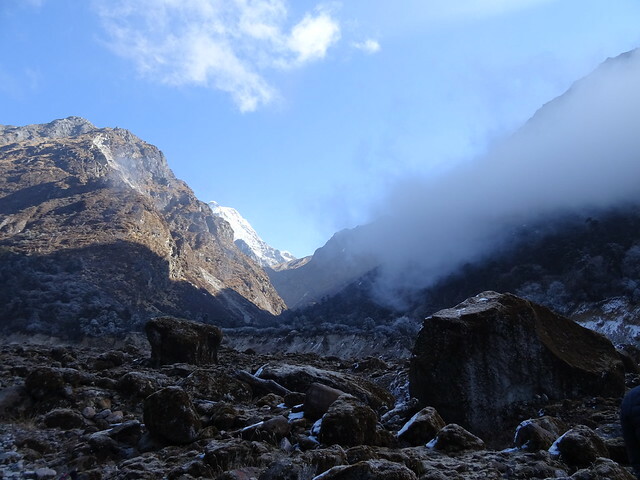 It was nice to head down the valley in sunshine and appreciate our surroundings, as on the way up we had spent much of the time in the cloud and mist. 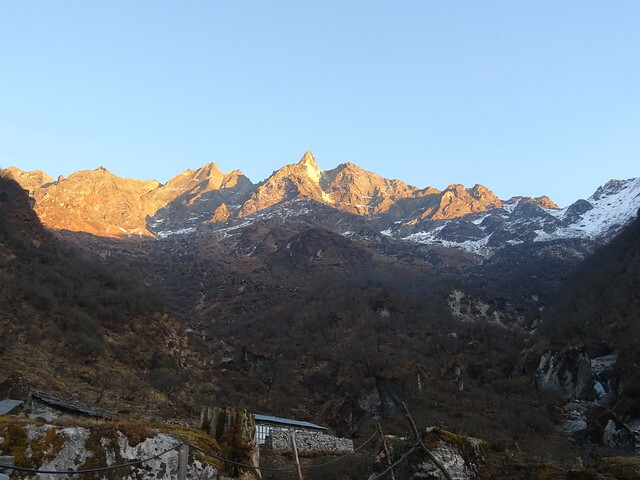 Arriving in Gotay it was clear there’d been a temperature inversion in the Hinku Valley as there was snow on the ground and it was much colder – so even though we’re back in lodges it’s as cold as sleeping outdoors. 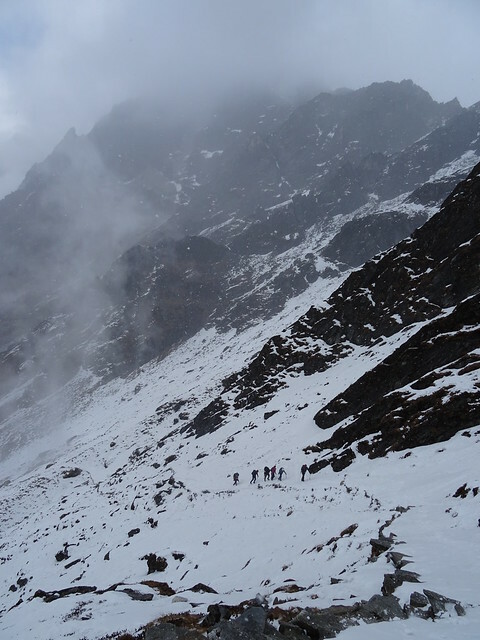 The following day we climbed out of the Hinku valley back to to the lodge at Thule Kharka below the Zatrwa La pass. 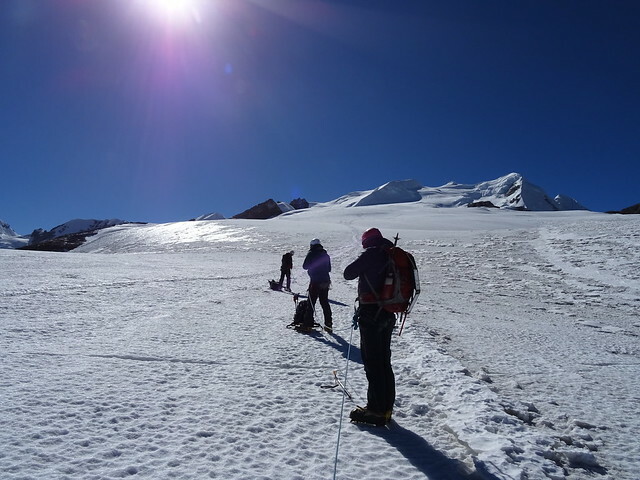 It was hard but thankfully much of the snow we’d had on the descent had melted so it was easier going despite ascending 1200m during the day. 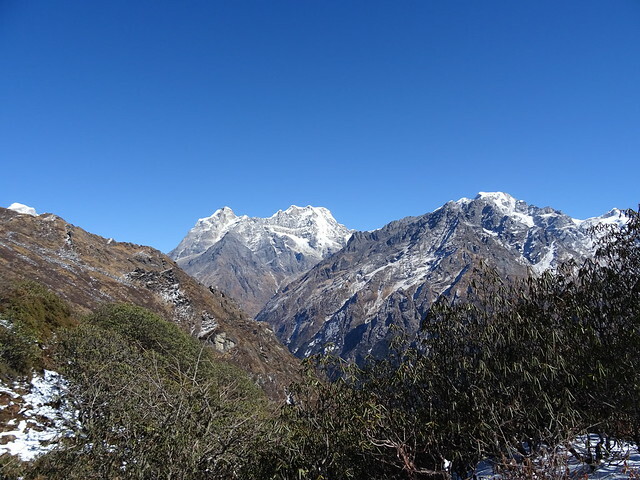 The following day we had strong wind but lots of sunshine as we headed on up to the Zatrwa La pass and along the top to reach the Zatrwa Og before descending to Lukla. 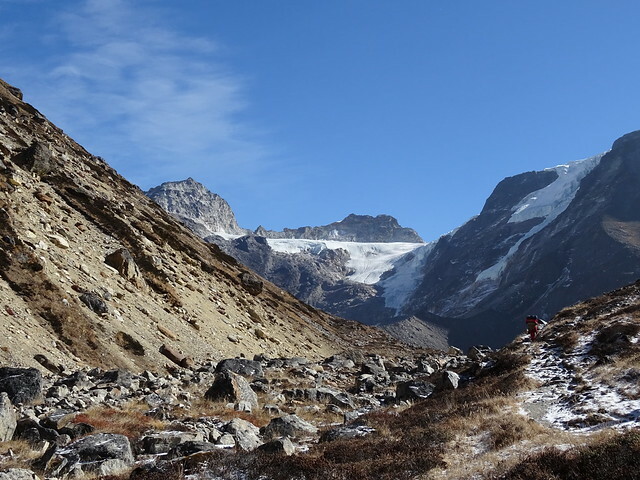 The traverse across the top of the pass didn’t seem so bad in reverse, and without snow, ice and mist it was possible to properly appreciate where we were. 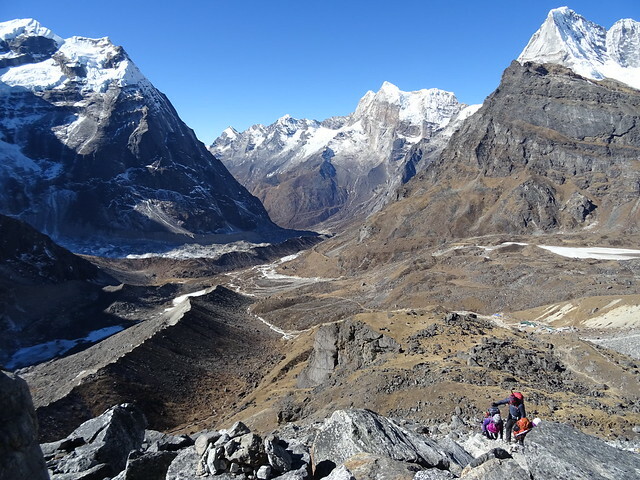 Amazing views over the lower Khumbu valley. 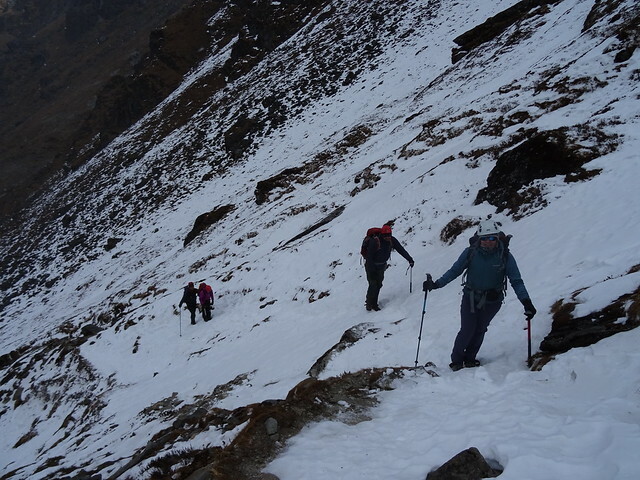 The descent down to Lukla was initially slow as we had to use crampons and axes as the snow here hadn’t melted and was in fact deeper than it had been on the way up. 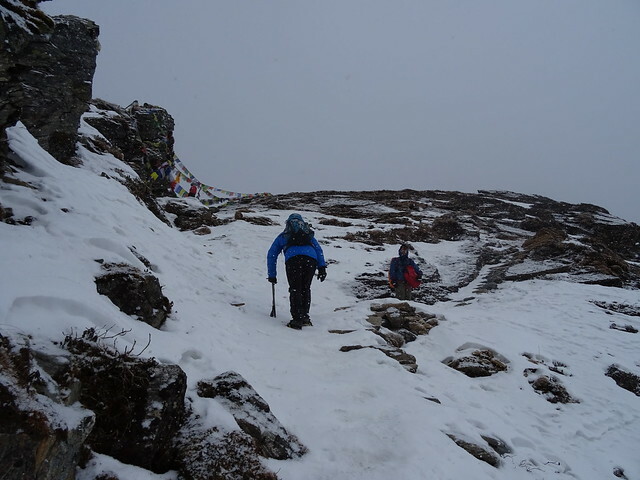 Once out of the snow the route downwards seemed to take forever but we did descend over 2000m over the course of the day to reach Lukla. 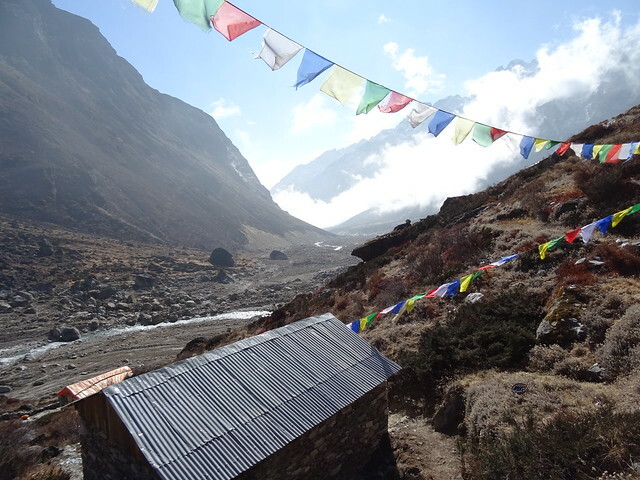 Nevertheless we were keen to get back, and keen to treat ourselves to good coffee and cake in the little shop in Lukla. 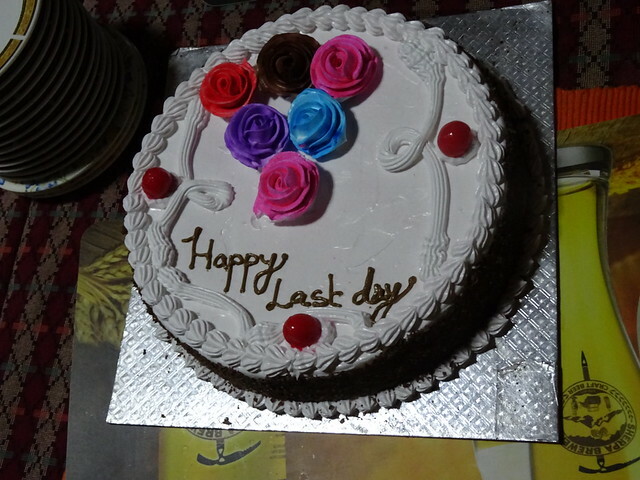 I was so excited when we got back that I doubled caked in the coffee shop, later making that a triple when the team got us an amazing cake as a celebration back at the lodge in town. We finished the night with a beers, whiskey and dancing – and despite the fatigue our team can certainly dance! 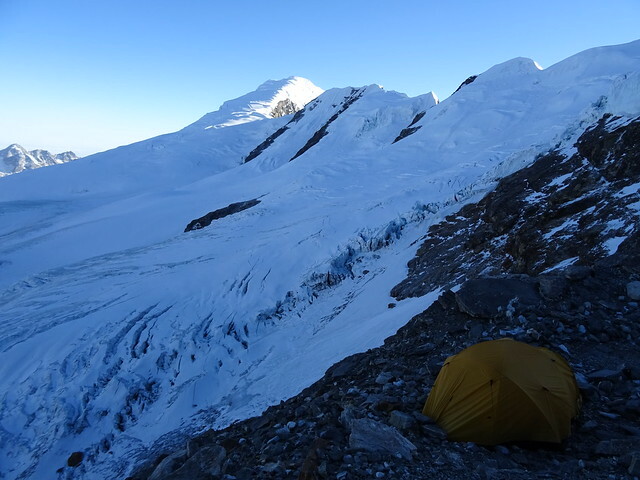 Not only did we not leave for the summit at 2.45am as planned but we spent all evening trying our hardest to weigh down the tents to prevent us sliding off the ledges. 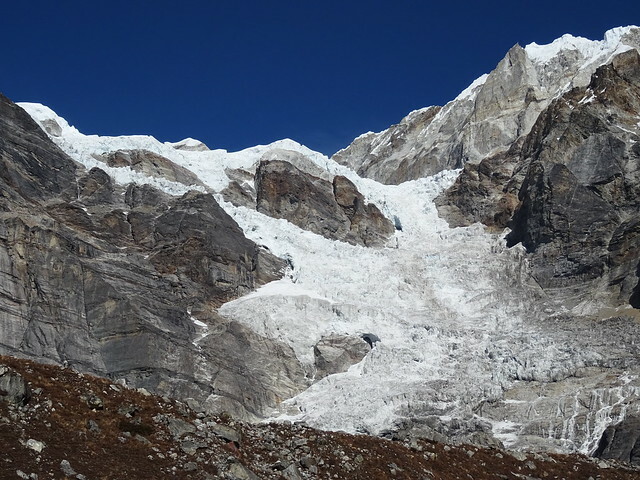 Around 8pm the wind picked up and was gusting at around 70-80mph, it was scary to hear it coming towards us like a steam train as it headed up the valley and across the glacier. 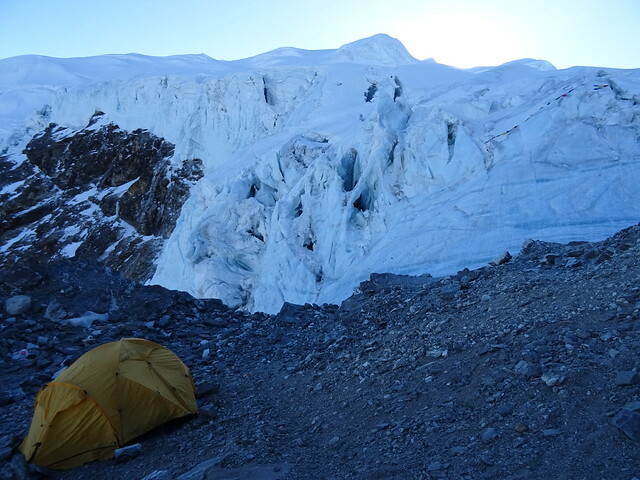 I’ve been in tents in high wind before and even had them collapse on me, but never in such an isolated and precarious spot. 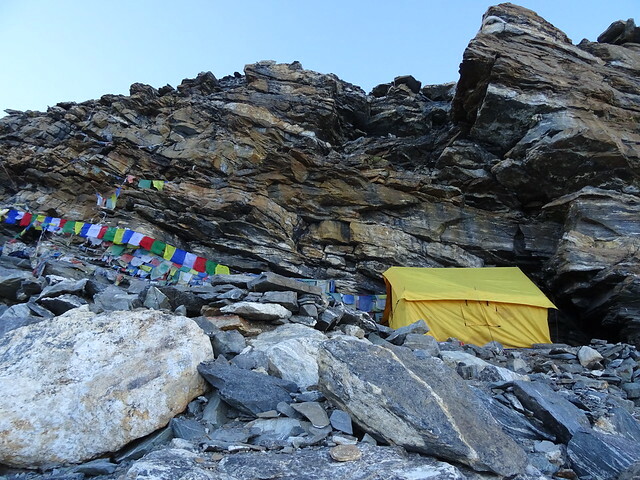 Our three team tents had been secured to the ledges by rocks pinning down the corners and the guy lines. 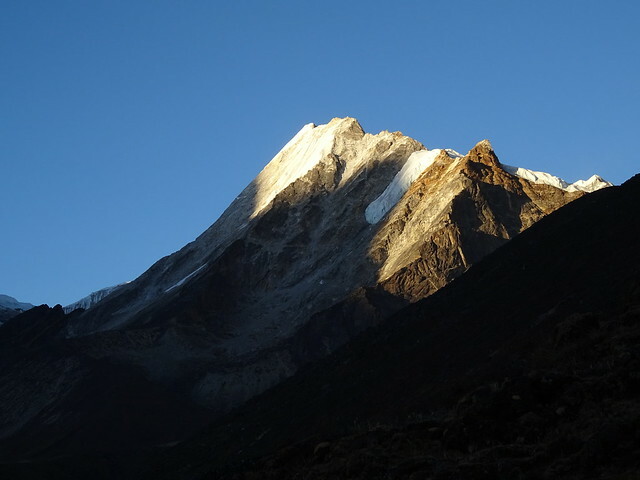 During the night our tent had come unpinned at one corner and we had slide about a foot towards the edge of the ledge. Sharing a tent with our leader Natalie sounds like a good idea initially, to not have to be on my own and share body warmth in the cold and have conversation too. But Natalie as leader felt obliged to go and check the other team tents throughout the night, so at certain points I went from being cuddled in my sleeping bag to keep warm, to doing my best star-shaped ballast impression as I tried to prevent the tent from blowing away Wizard of Oz style. 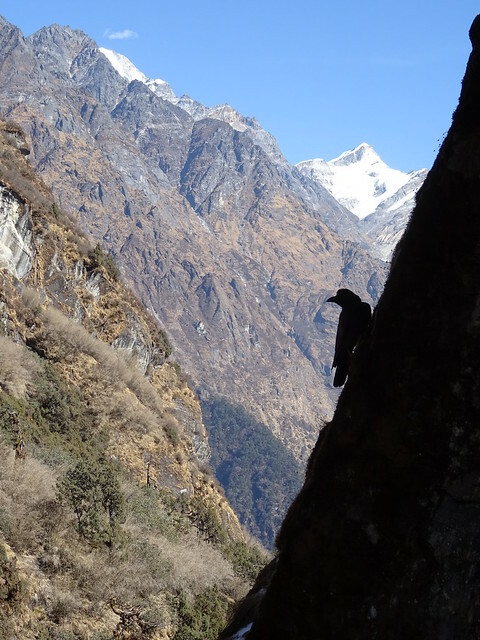 I don’t scare easily, but I was genuinely worried about sliding off the ledge to the abyss below. 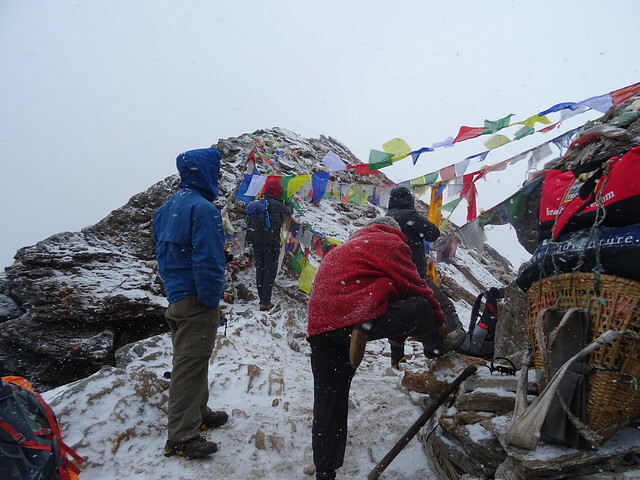 Spending the night trying not to be blown away in the wind it was clear that we were not going to be able to try to head for the summit as planned. And frankly, none of us really wanted to die in the attempt, it wasn’t worth the risk of being blown away. When the sun arrived at 8am the wind started to ease, by that I mean it dropped to 60mph and just safe enough to leave the tent. Adam and Nick has been told by Phenden to pack up and wait in the tent until they were ready to pack it away behind them, to prevent the tent being lost. But as their fly sheet came un-attached, they decided it wasn’t worth the risk to stay and bailed out. Poor Andy had been in a tent on his own for the night since April had left at the previous camp, so he had a unnerving night trying to pin the tent down alone. 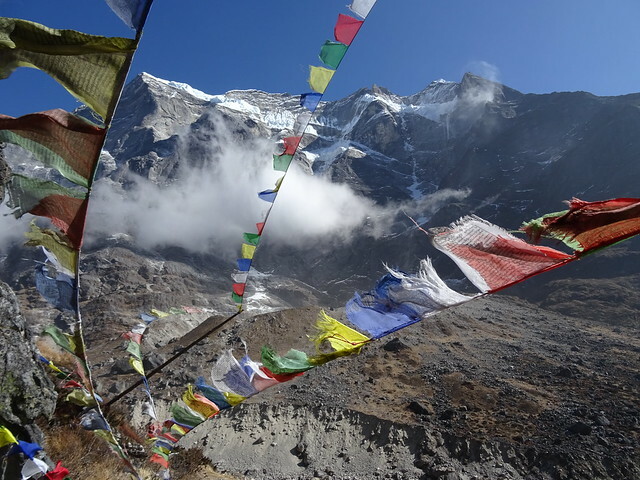 His tent suffered damage to the poles. 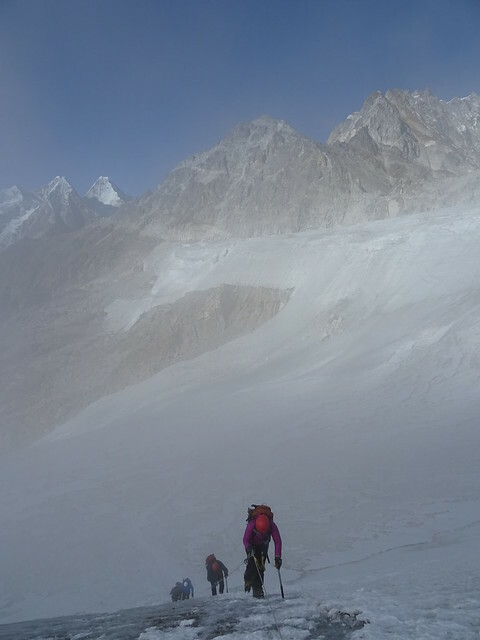 So at 9am we were kitted up and heading back down to Khare, roped together. 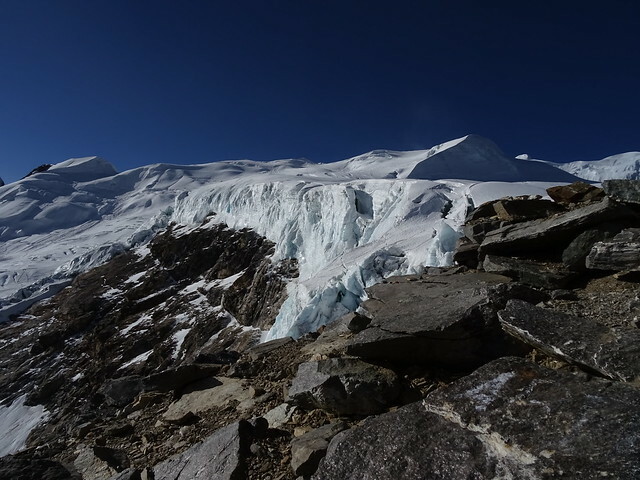 The decision had been made to leave some of the team kit at high camp and try to retrieve it the next day. 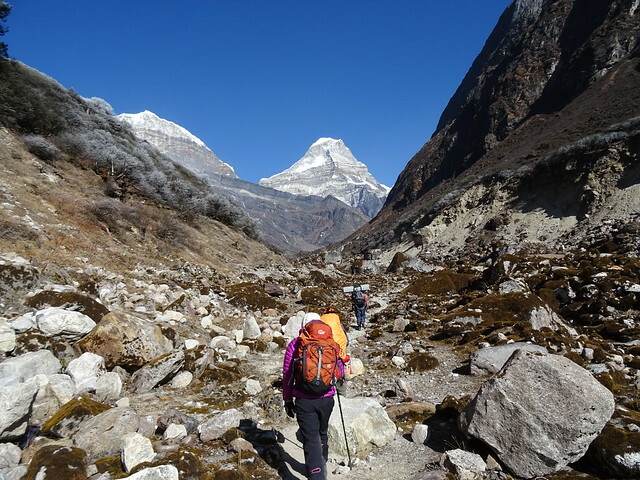 It was more important we got down as quick as possible, and that our porters didn’t have to come up unnecessarily. 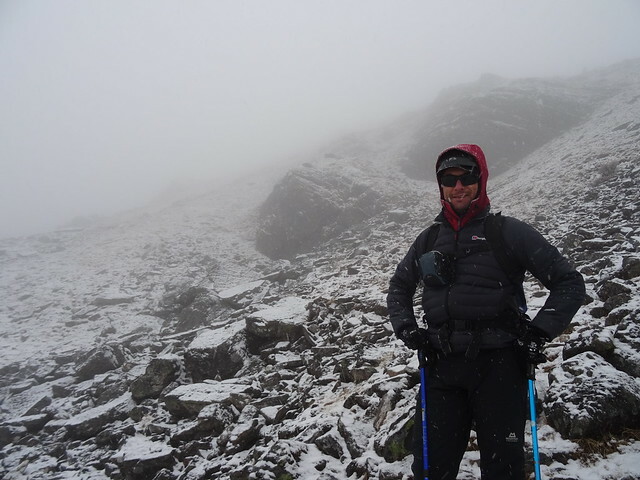 You’d never tell from the photos how cold and windy it was! 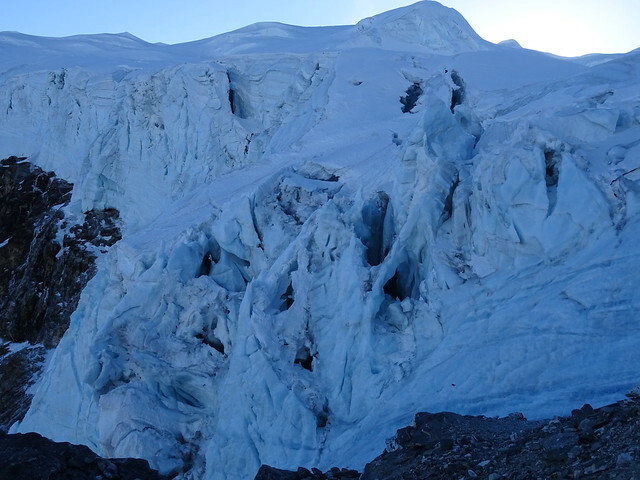 The descent wasn’t without drama as several severe gusts continued to blow across the exposed glacier crest, though thankfully it wasn’t continuous wind. So in between bracing ourselves in the wind I managed to get a few pictures. 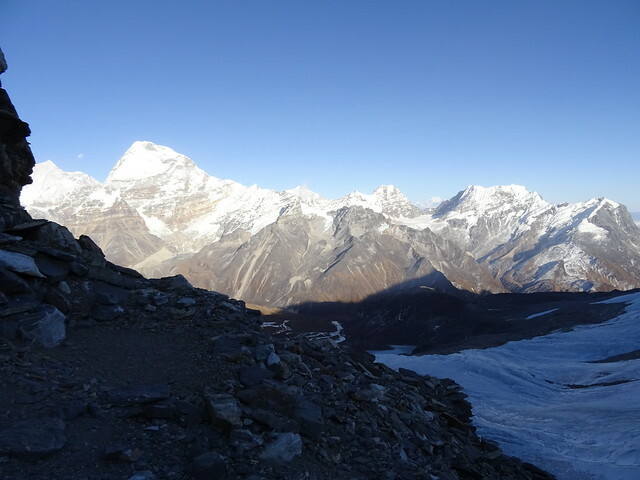 You can see Everest in the distance – with the high winds blowing from the summit. 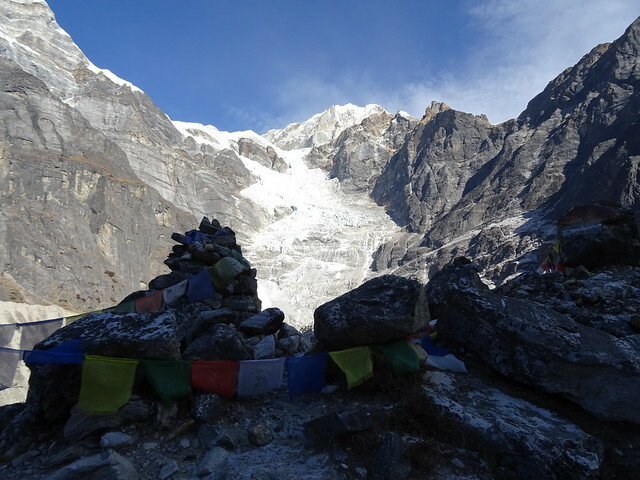 Back down at Khare in the safety of base camp its possible to process our adventure. 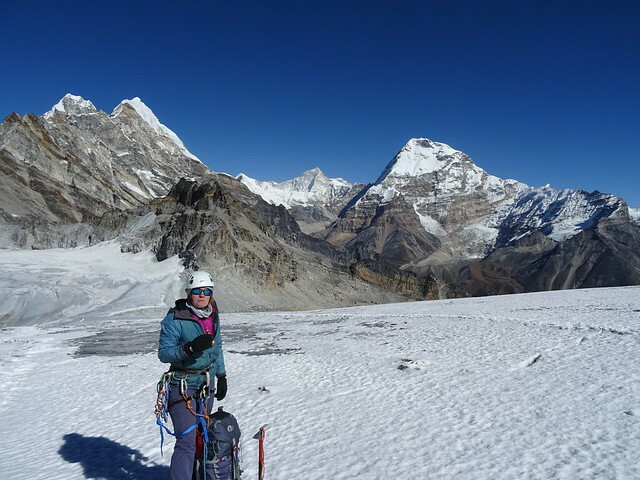 Yes I’m disappointed that I’ve not been able to summit Mera Peak, but I’m happier than we all survived the night, and frankly we got an amazing view of the Himalayas as we descended so I still got to see Kanchenjunga, Makalu, Lhotse, Cho-Oyu and more importantly Everest in the distance. 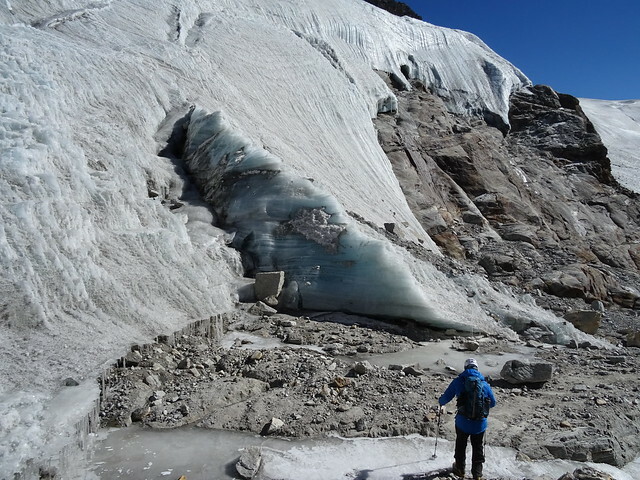 It was certainly hard to descend though in the gusts – the wind in the winter blows all of the snow from the glacier, exposing old ice like glass – beautiful to walk across but impossible to drive an axe end into to brace in the wind. I’m hardly light but I did have visions of being blown away! 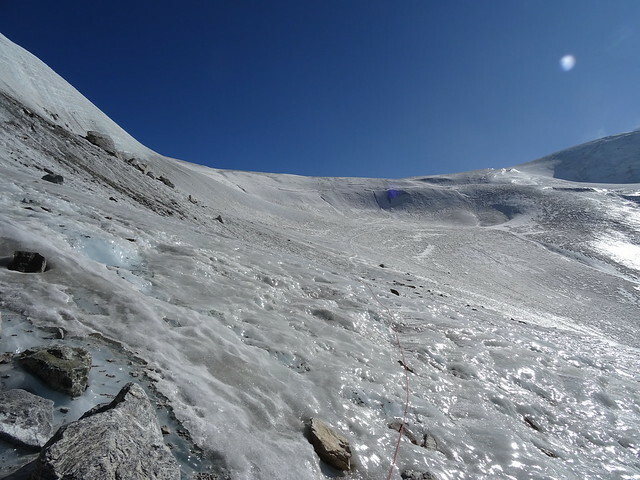 We abseiled our way back down the roped line to the lower section of the glacier and then headed back to the safety of the rocks for our slow descent back to Khare. 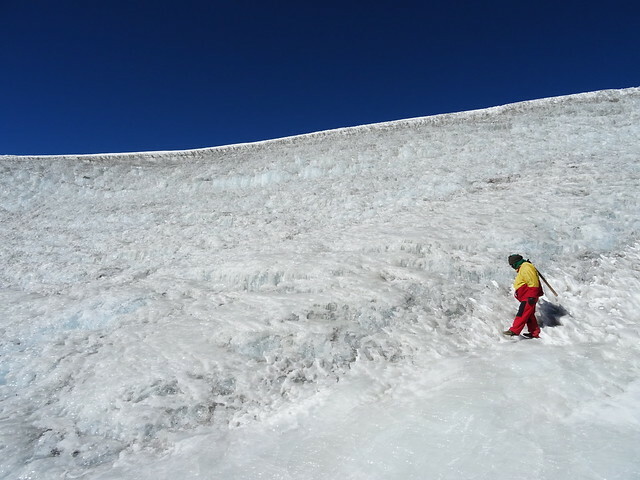 Scarily one of our porters had a very close brush with death today as he slipped on the lower part of the glacier and only just managed to grab the fixed line. If it hadn’t been there he would have gone, with no way of stopping himself on the ice – he is ok thankfully, just bruised and shook up. 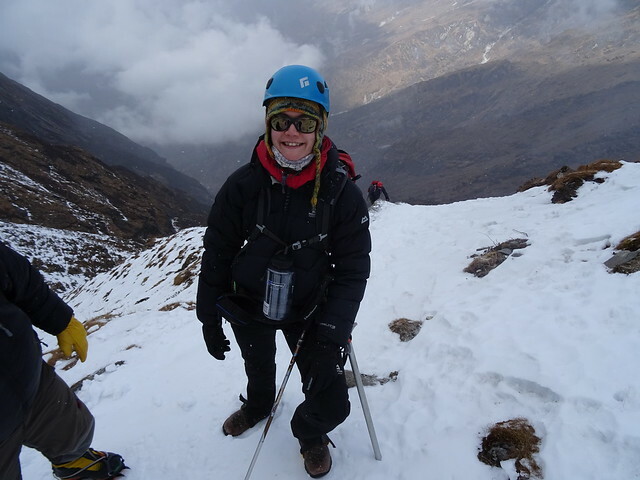 It does make you realise they should have proper crampons on and not the little spider crampons. 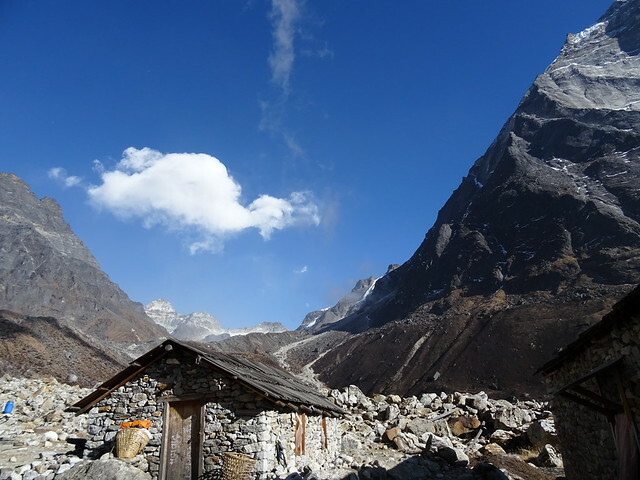 When we arrived back at Khare it was clear that the strong winds weren’t just across the mountain top, as the remaining team had spent the evening battening down the roof of the lodge. 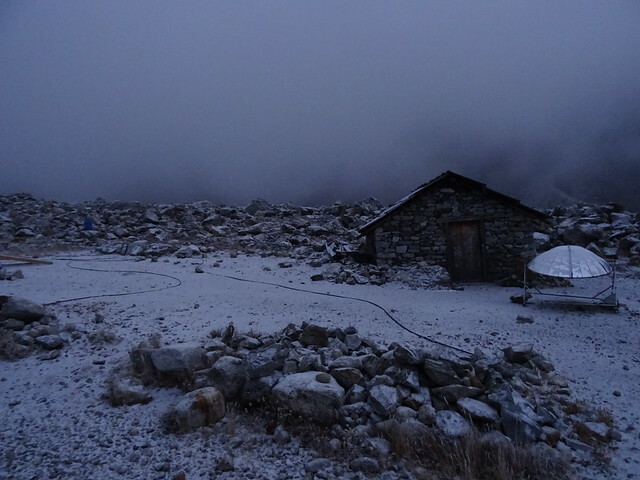 The long drop loo didn’t survive the night though, having not only blow down but completely blown away! 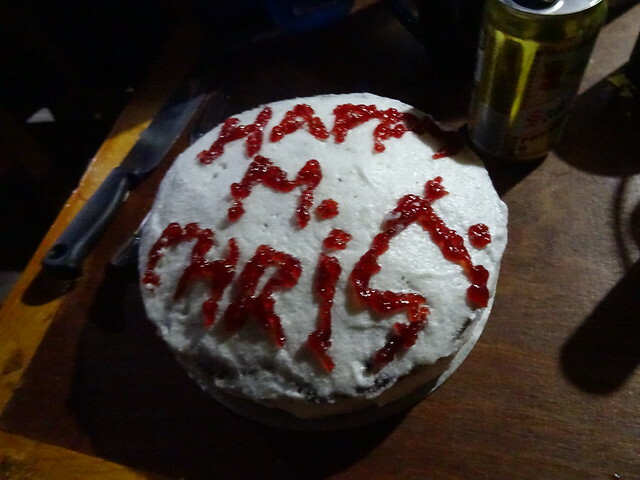 I can’t really believe its Boxing day – despite all the trouble the team have decked out the dining area with balloons and made us a Christmas chocolate cake which after this morning is about the best thing I could get for Christmas. 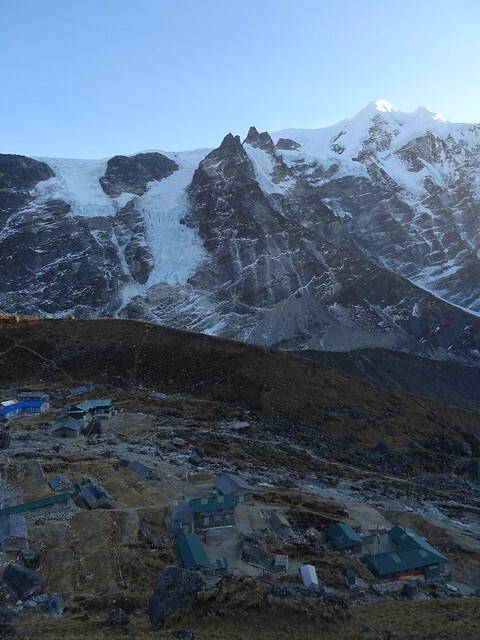 We’re having a rest day here at Khare to allow the team to go back up to high camp and retrieve kit and the lodge down at Tagnag is also closed now. Its going to be surreal to actually have a day doing nothing after the last few days. 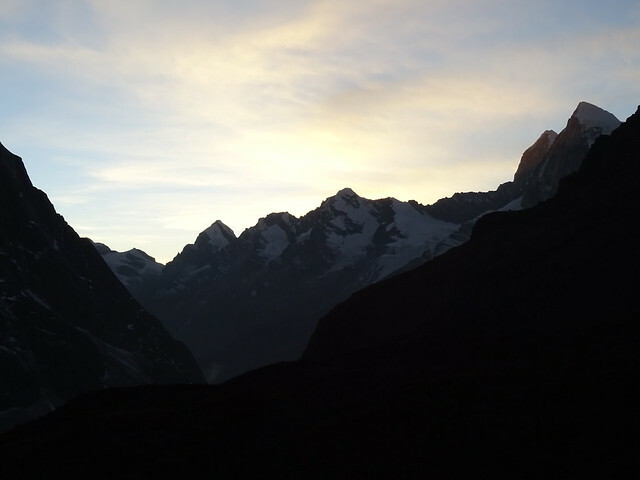 Its Christmas Eve and I’m sleeping in a tent on the Mera La Glacier at 5400m!! 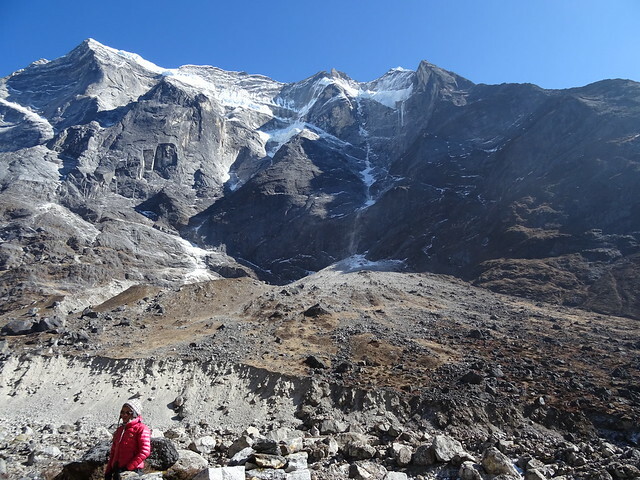 We left Khare this morning early and the walk up to the edge of the glacier took till lunch – its steep and rocky and in our mountaineering boots was really hardwork. 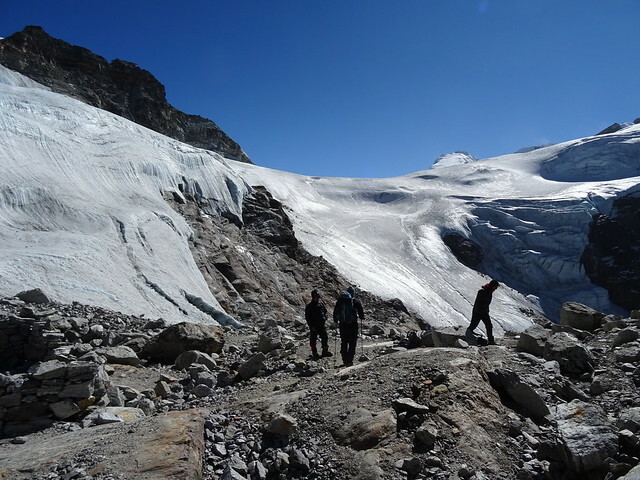 There has been rockfalls in the last year so we had to wind through scree and boulders to reach the glacier rather than take a direct route. 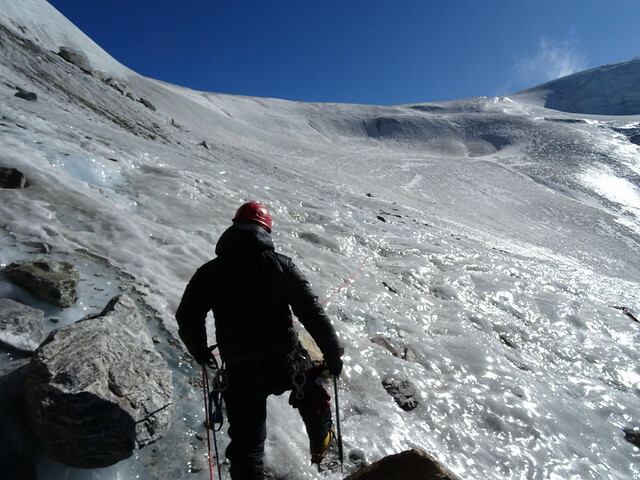 I was excited when we finally got to put on our crampons and harnesses and set off walking alpine style – roped together – and using a fixed line to head across the ice. 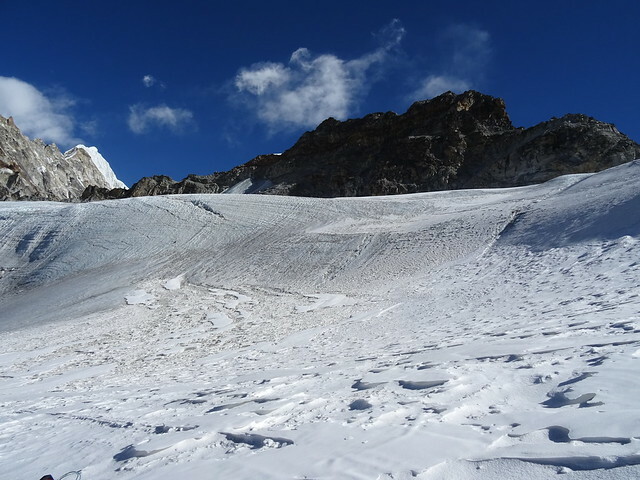 The fixed line was really for the porters who do not clip on but use it as a handrail as they head across the ice with heavy equipment. 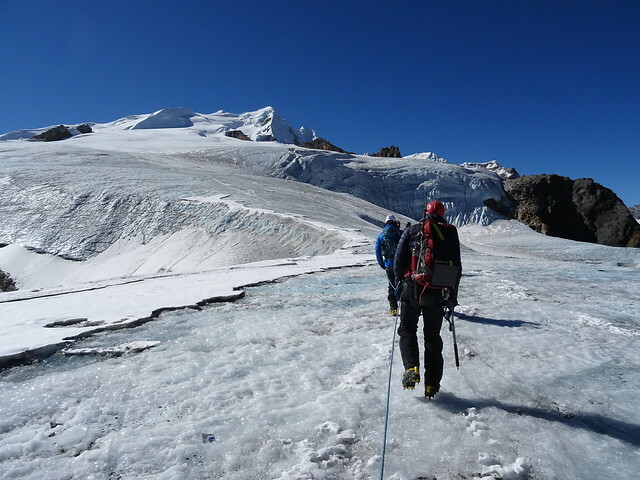 It was hard going initially as the ice is polished like glass and hard as concrete – scoured by the strong winter winds, and with us all walking a different speeds it was difficult to maintain a good pace as we approached the headwall of the glacier. 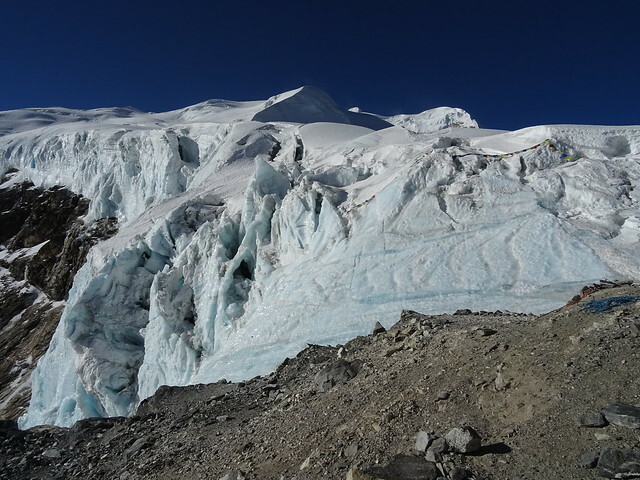 The team had added a haul line to aid the porters ascent of the glacier and move the equipment. 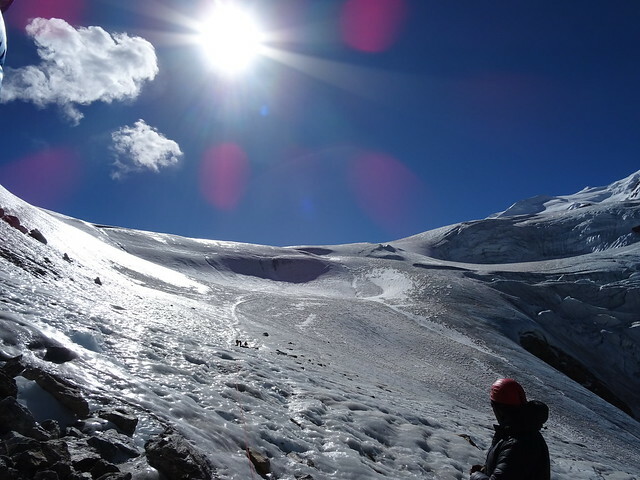 We used ascenders to jumar up to the top of the line to reach the top of the Mera La glacier. 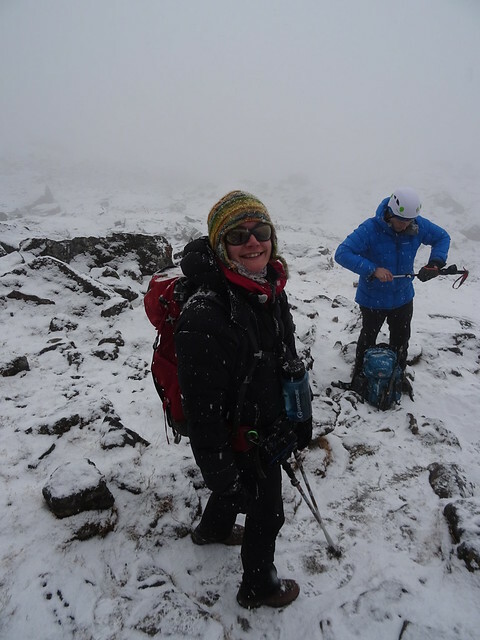 It was hard work, but great fun though the cloud descended as we all reached the top and the wind picked up. 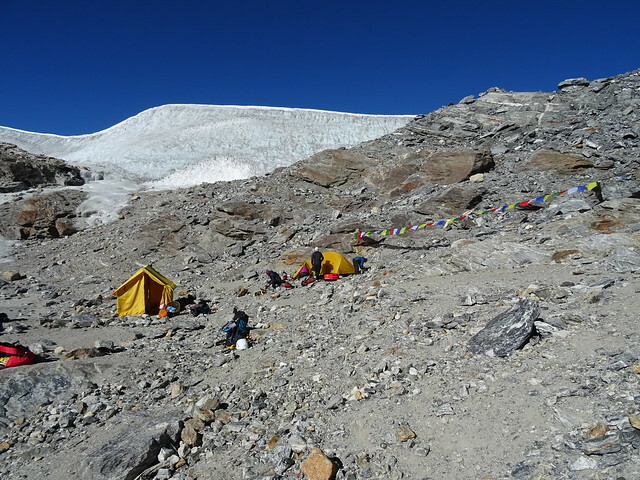 We quickly crossed the glacier top and descended the other side to a rocky plateau which is our camp for the night. 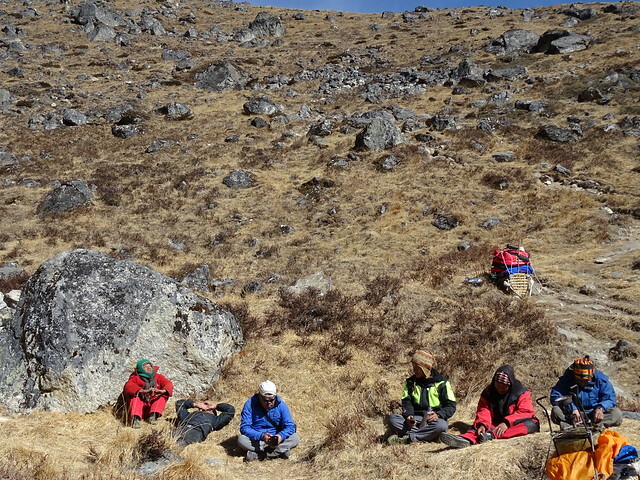 We didn’t reach camp until 4pm and the team had already set up tents and had soup waiting for us. Heroes, they’re all superheroes. 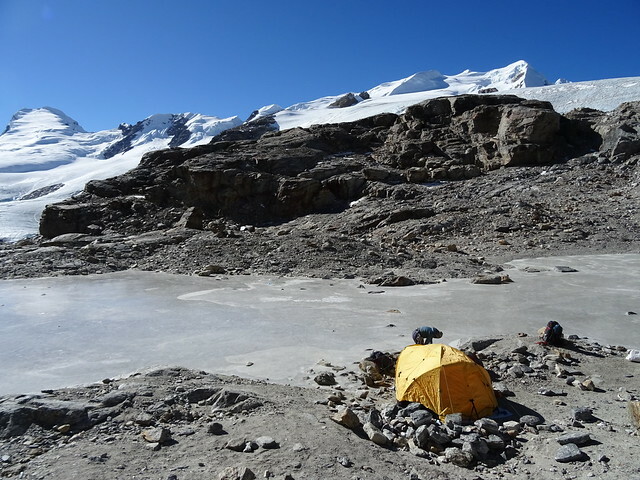 I’m sharing the tent with Natalie, our group leader as we’re the only single females on the trek – we have an amazing view across a little lake and up to the summit of Mera. 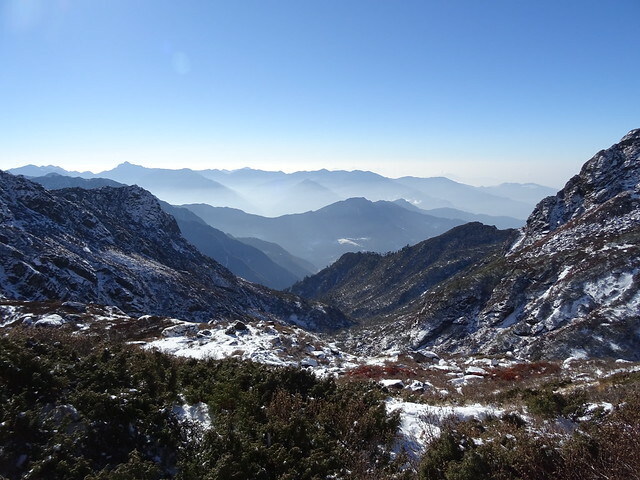 A perfect place to celebrate Christmas. 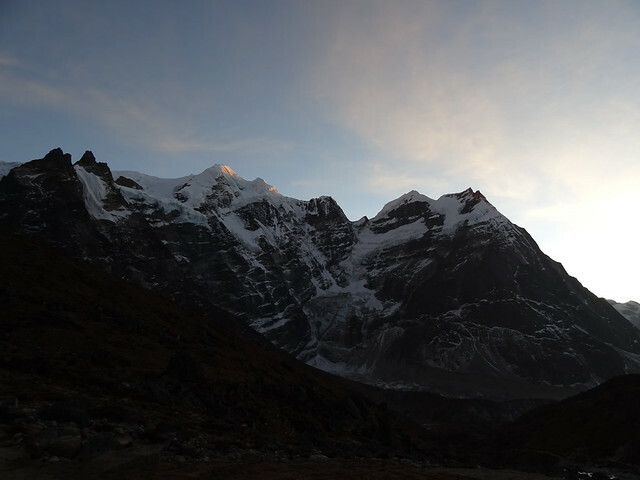 Its cold and windy so as you can imagine we were in bed before sun had even gone down and Bindra – our trekking porter and our greatest superhero in the team despite not being a climbing sherpa – brought us soup and noodles for tea, along with hot water in our naglene bottles for our sleeping bags. God I’m going to need those tonight as its already minus 15 degrees and the sun has only just gone down. Brrrr. 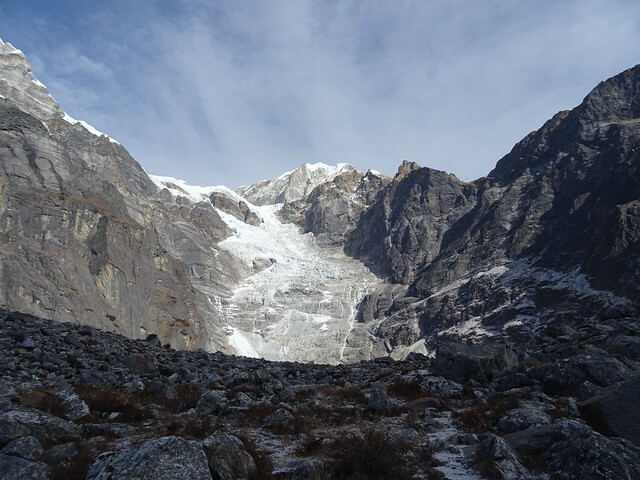 We stayed one more night at Tagnag to allow us to acclimatise – which meant a walk to up a nearby hill top adjacent to the Kusum Kanguru and its glaciers. 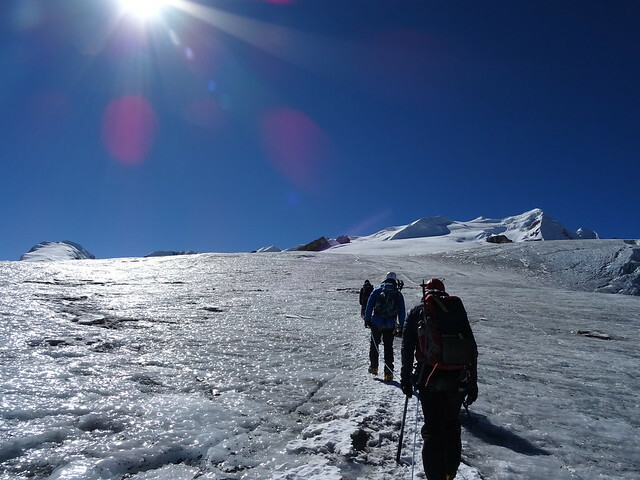 It was a tough slog up as it was quite steep and at this altitude it felt so much harder. 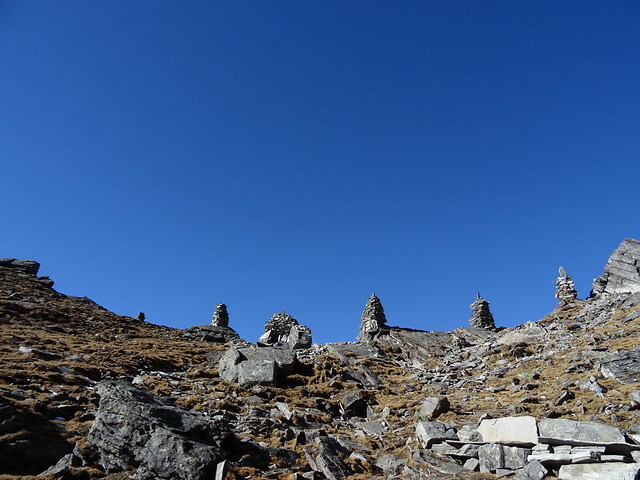 Only two of us managed to get to the top of the hill at 4900m and while I felt ok I was certainly out of breath and as has happened before I had a migraine aura at 4500m (though thankfully no headache). 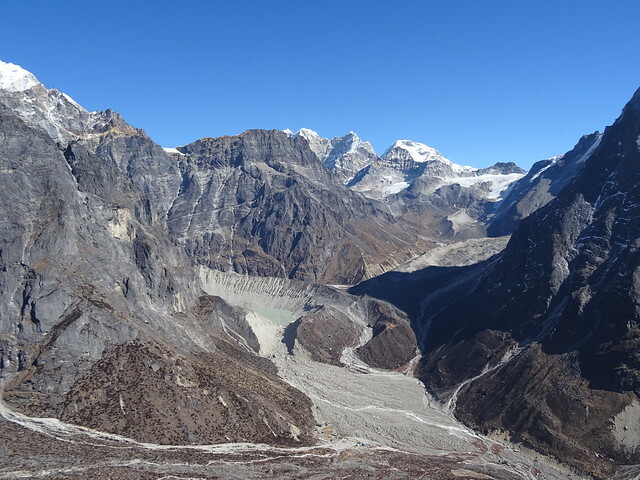 The view was worth the effort as at 11.30am when we reached the top we had amazing view across the neighbouring mountains and up the valley to our base camp at Khare and the Mera La Glacier. 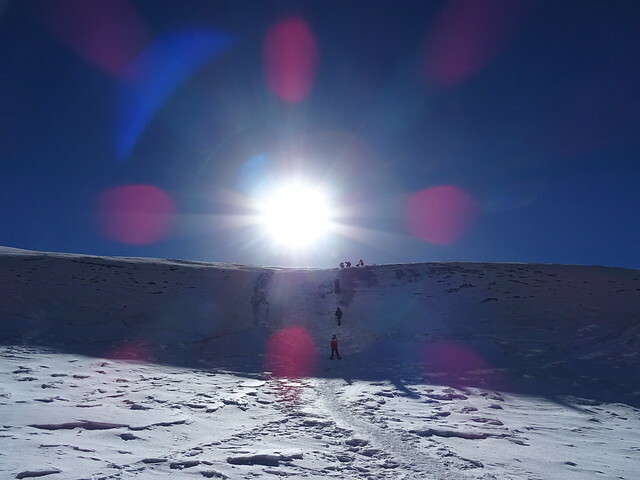 Amazing sunshine but at minus 10 degrees it was really cold and that doesn’t account for the wind chill. 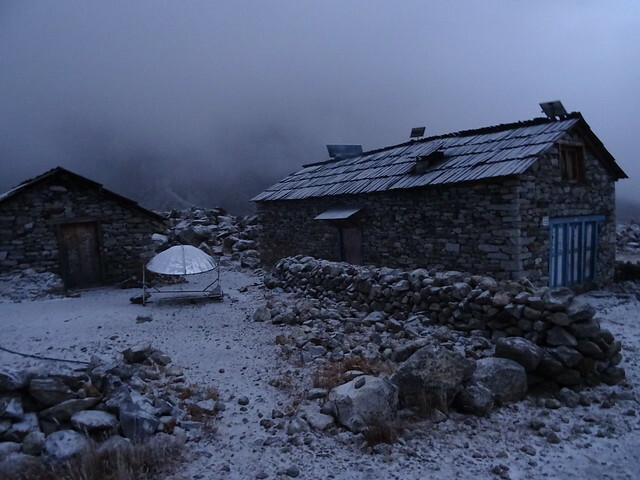 After another cold night at Tagnag, the following day we headed up the valley to Khare, our basecamp for the Mera Peak. 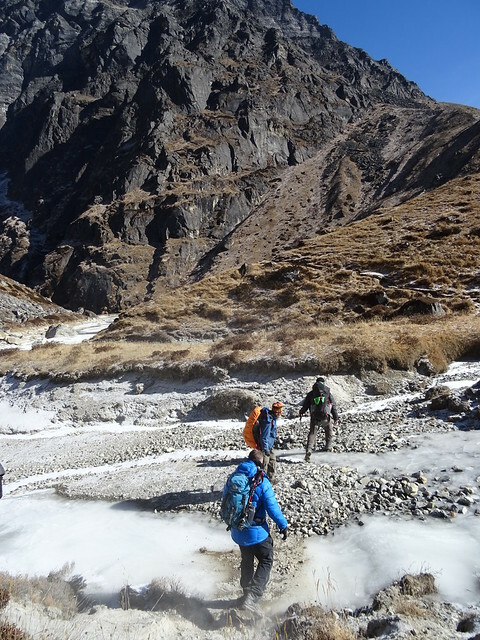 Despite the altitude and cold its was a nice walk up the valley, climbing 700m as we followed the frozen river up to Khare at 5045m. 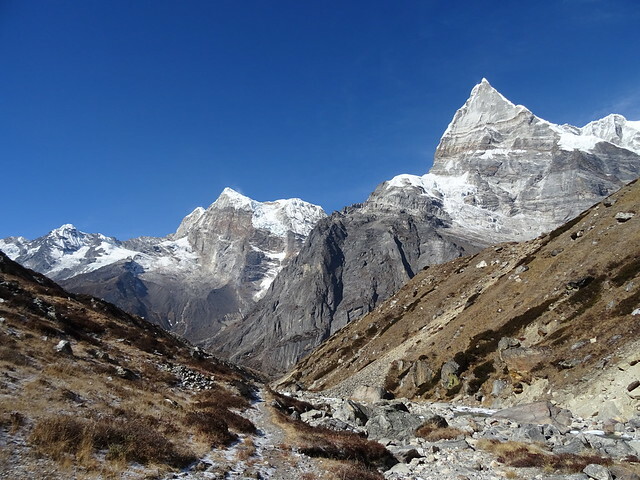 I’ve been quite pleased that I’ve not only still got an appetite but I can’t stop eating, which is great as my last trek this high I lost my appetite really early on. 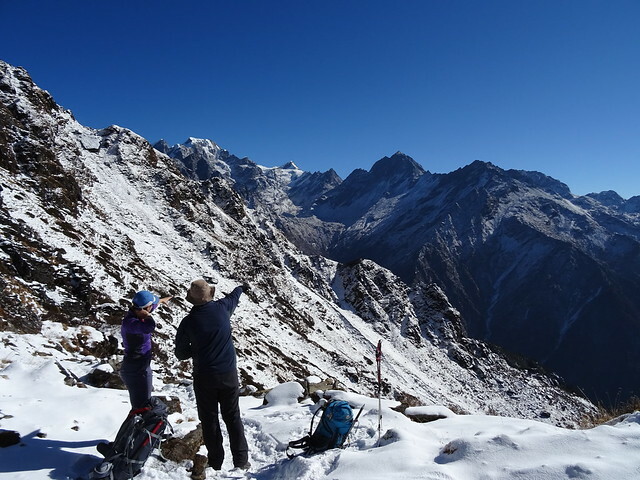 Its also great that we’re at Khare, as its Christmas in a few days and this is an amazing place to spend it – amazing view of Mera Peak and the glaciers and amazing food – considering we’re about a week from civilisation! 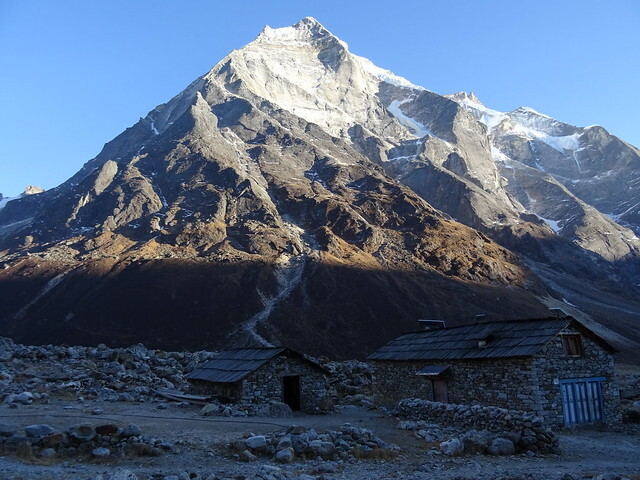 We had an extra day at Khare for further acclimatization and final kit checks. 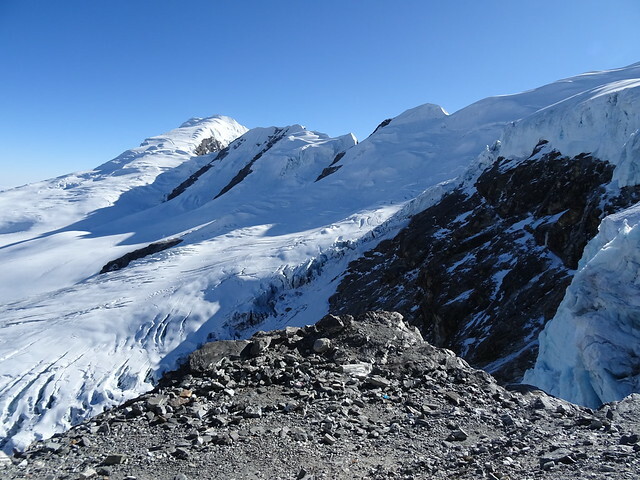 And crucially practising putting on crampons with our big gloves on – as on the glacier it will be too high and far cold for us to take them off without risking frostbite. 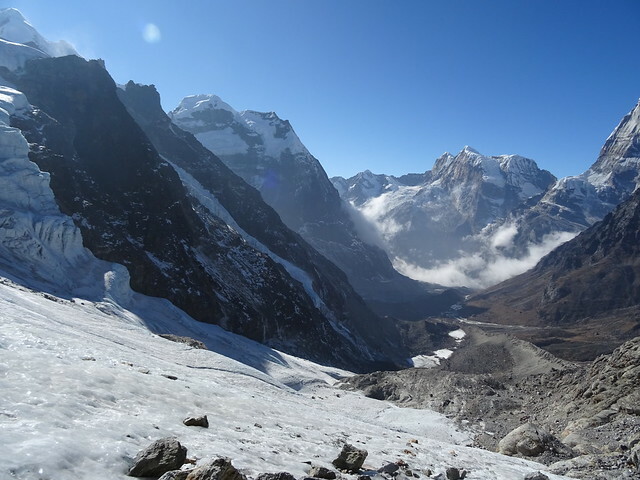 We also had to ration our kit down to half a bag’s worth so we’re taking the least amount of kit up on the glacier and thus preventing the porters taking unnecessary weight. 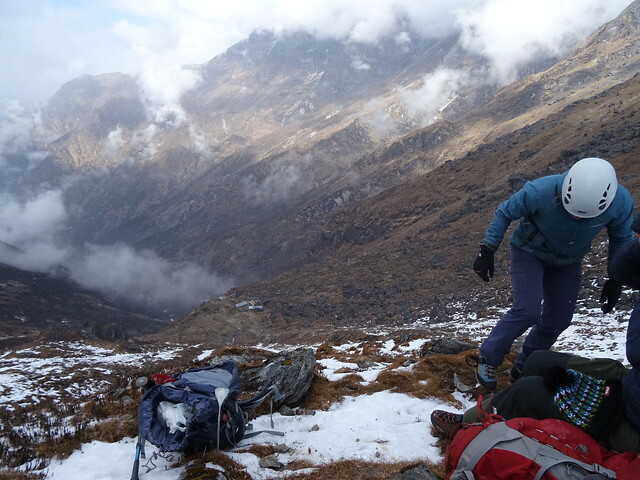 After I’ve packed my sleeping bag, roll mat and extra layers, there’s not much room for anything else. 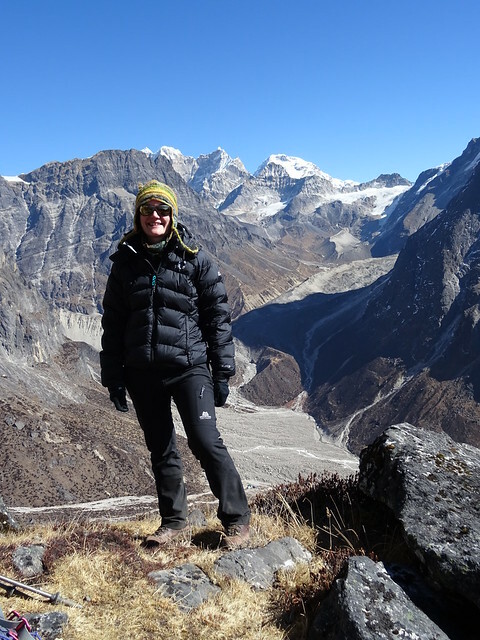 As we’re away over Christmas our trip leader Natalie gave us Christmas presents tonight which is really lovely of her – prayer flags, a scarf and crucially chocolate – that is coming with me! 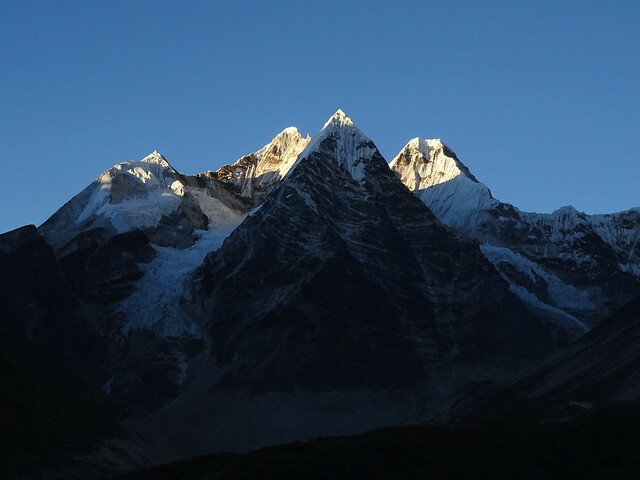 For the first time since I’ve been in Nepal I wish I could wish my family Merry Christmas. 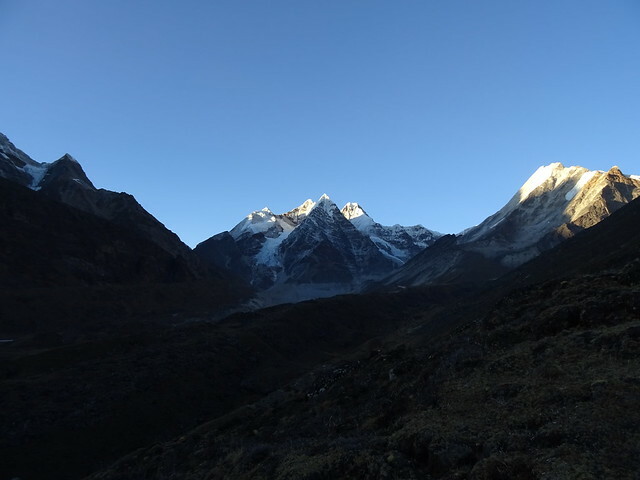 It was freezing last night and while drinking 4 litres of water a day is good to prevent altitude sickness, the downside is numerous trips to the loo in the night. 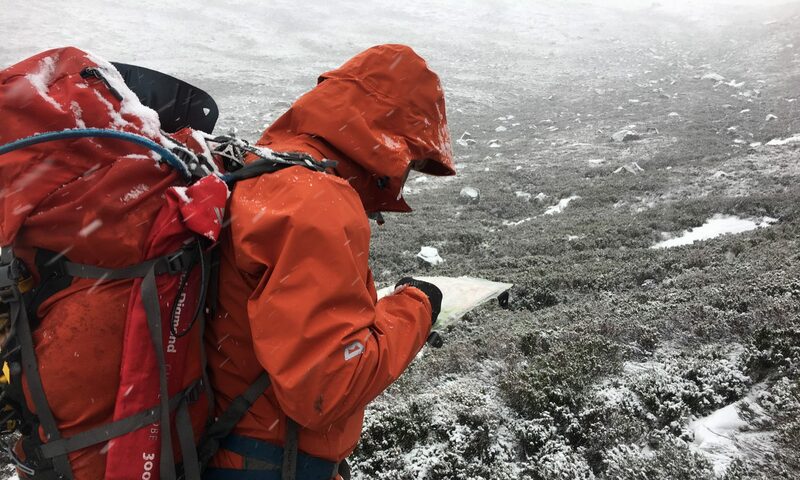 I’ve yet to risk using a pee bottle – it just seems potentially too messy for girls, especially when I’m using a borrowed sleeping bag. 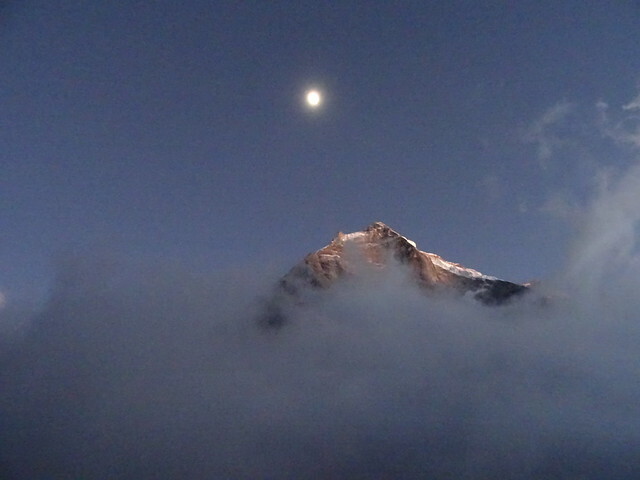 And frankly by the time I’ve psyched myself up to leave my sleeping bag, I might as well head outdoors. 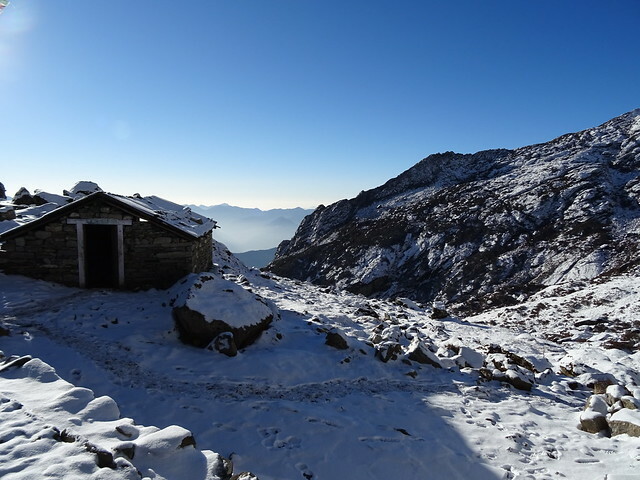 It was freezing – clear skies full of stars resulted in the water trough for flushing the loo being solid ice. 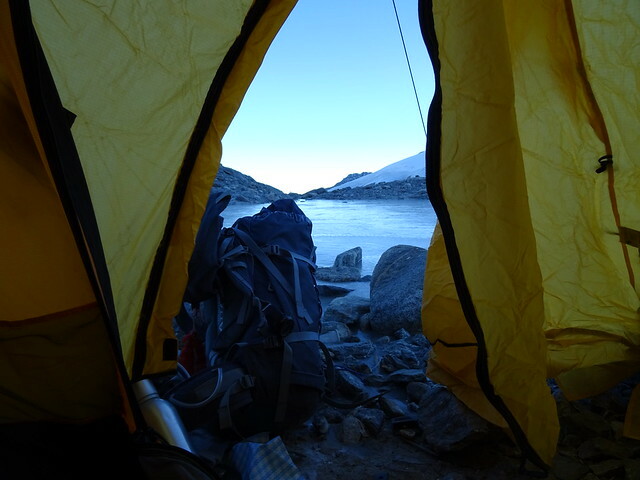 When morning finally came around I was surprised to find the bottle I was hugging was still full of warm water. I was toasty in my sleeping bag, the downside being getting out for breakfast. 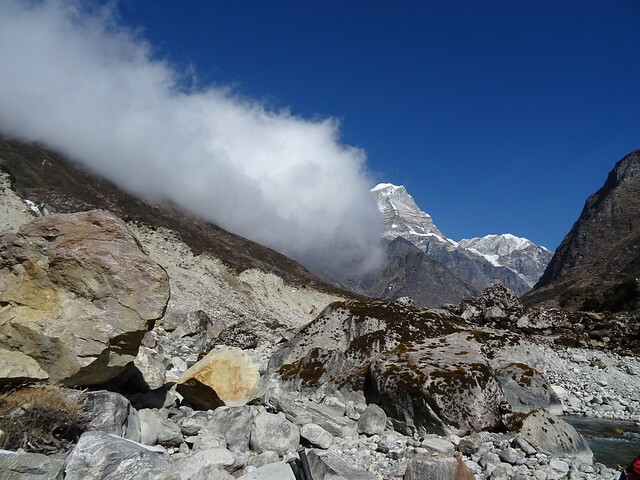 We left Kathmandu 6 days ago. 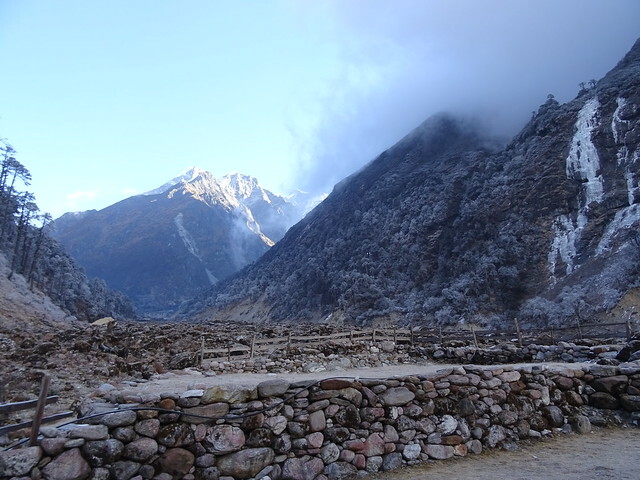 As it is out of season the lodges do not have showers or hot water available for washing; unless we request it and wait for the team to boil it over a fire to give us little bowls for washing our faces and hands. 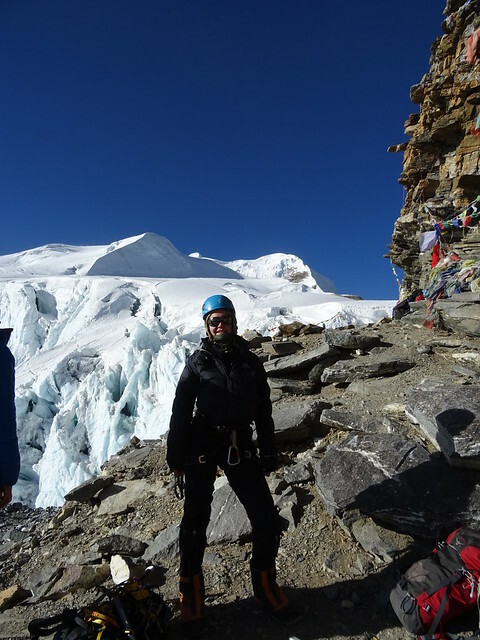 As you can imagine my hair is already disgusting and I don’t mind admitting to wearing the same base layers since we left Lukla. Did I mention it’s freezing? I’m not getting completely undressed for bed! So I’m well on the way to stinking too – thank god for merino the smell shouldn’t appear too soon. 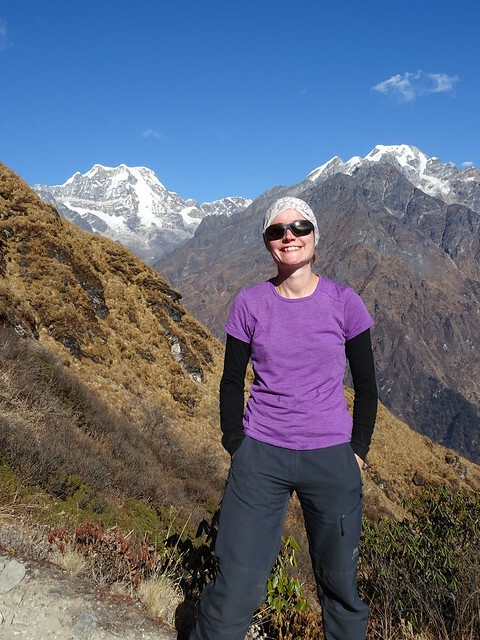 No one has seen my hair anyway since Lukla since I have had a woolly hat on my head pretty much continuously. I don’t mind roughing it. 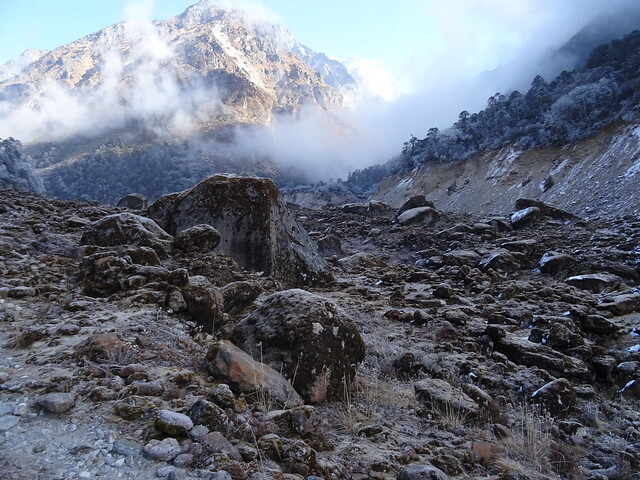 After pancakes and lots of hot tea for breakfast we set off through the cold mist to head for Tagnag, where we will spend 2 nights to allow us to acclimatise. 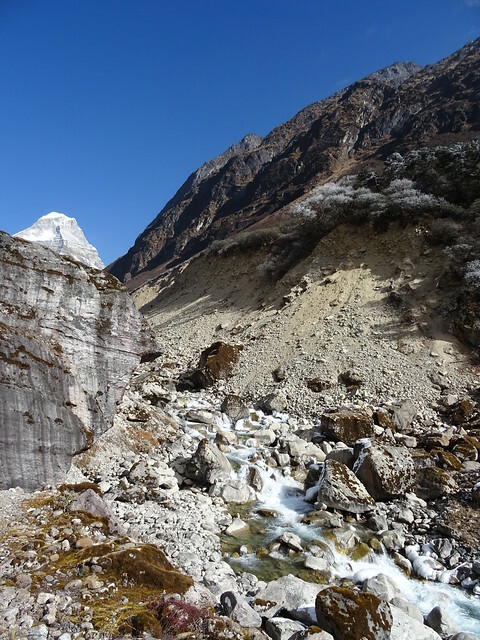 The path up the river remained rocky from the debris washed down from the flood in the 90’s, so we spent the morning rock-hopping. 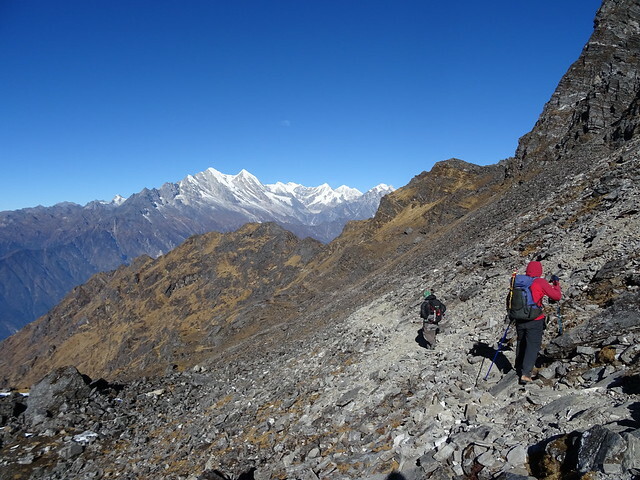 At least it’s not a steep ascent up to Tagnag, though we did climb 800m over the day. 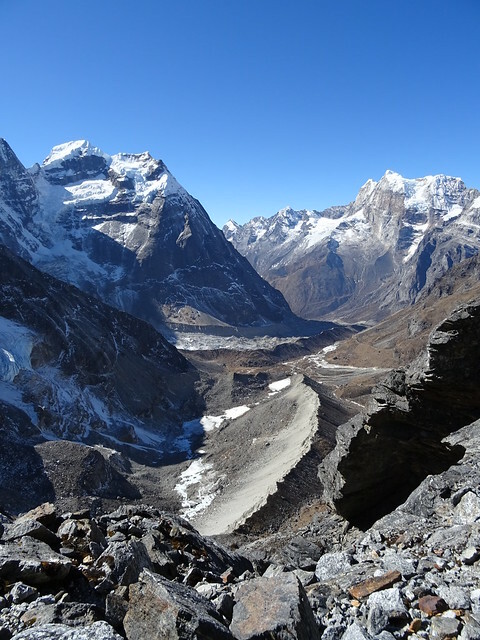 The upper Hinku valley is completely desolate but amazing, with the mountains of the Kusum Kanguru and Peak 43 looking down on us. 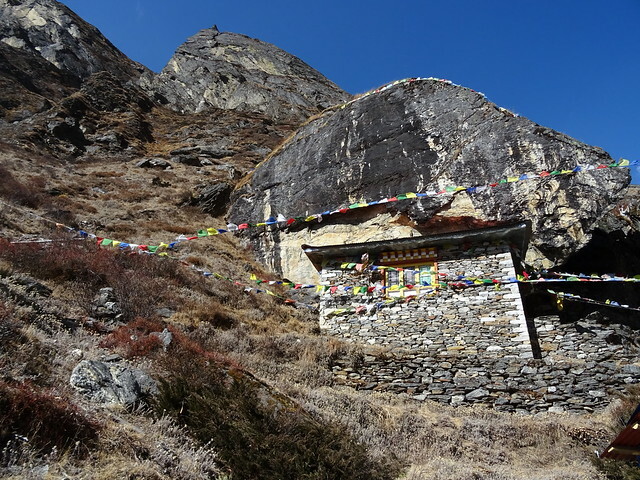 Around lunchtime the mist lifted and while it remains cold and windy we were treated to sunshine as we stopped for lunch at the little gompa built into the rocks. 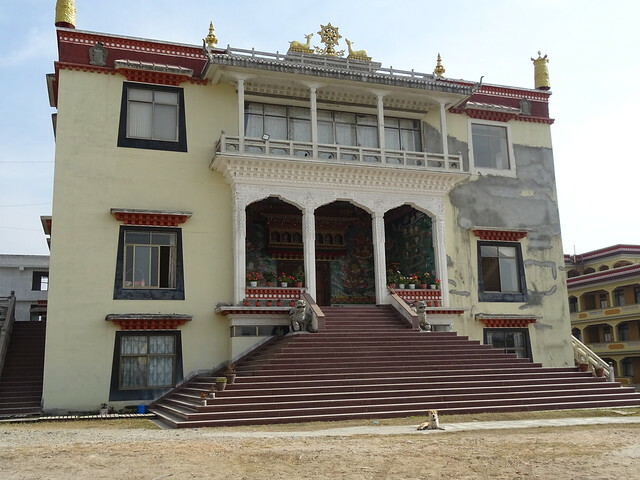 The gompa or hillside temple is apparently managed by a lama in the busy season who lives in the adjacent building. In such an isolated spot I can understand why he isn’t there all year around. There’s no nearby community for him to serve. 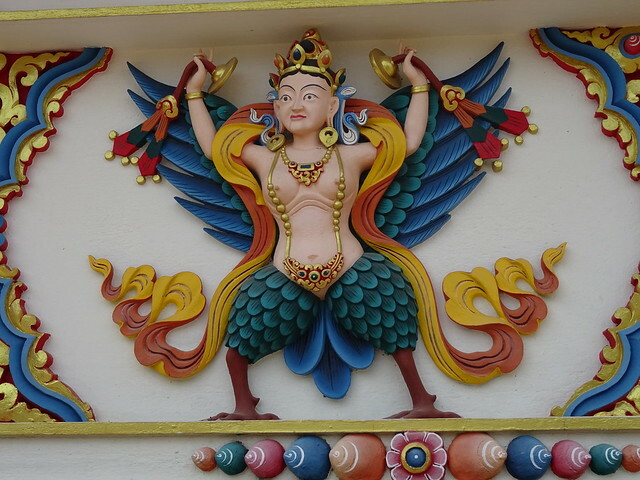 Thankfully our Sirdar Phenden is able to open the gompa for us to have a look inside and the team burn juniper as a blessing to wish us good luck. 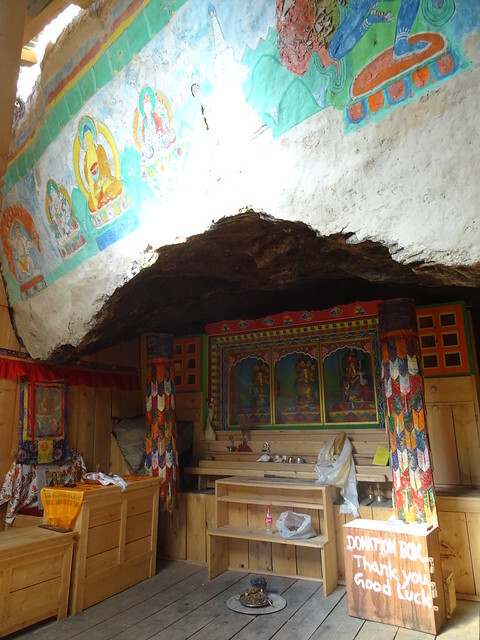 Phenden tells us that the Buddhist icons on display were found in a ruined village much further up the valley before being moved to the gompa when it was created 200 years ago. 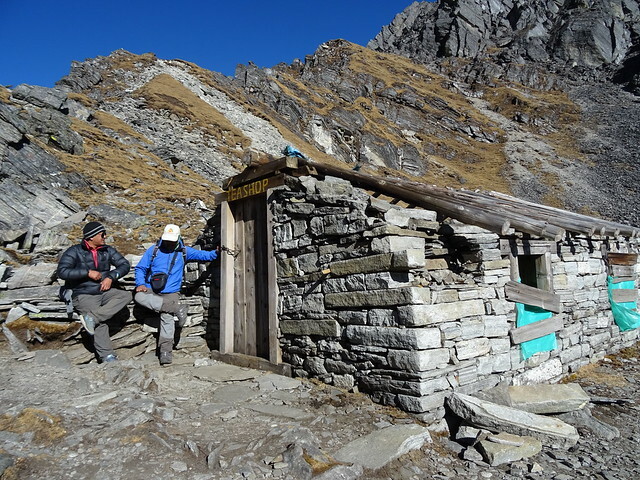 After a long break we continued up the valley for another hour or so to reach Tagnag – another isolated lodge at 4350m. There’s a cluster of lodges here, but like the other places we’ve walked through we’re the only ones here so only one is open. The nicest one in my opinion – the toilet isn’t too far to walk in the night. 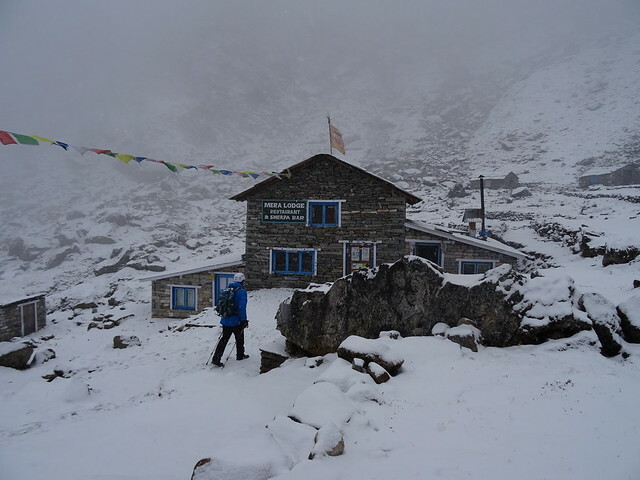 We arrived at Tagnag at 2.30pm and had a bowl of hot soup to warm us up, since then we’ve sat around chatting and drinking tea. Had more soup and momos for tea tonight, and a bowl of custard with a biscuit which seems like a real treat. 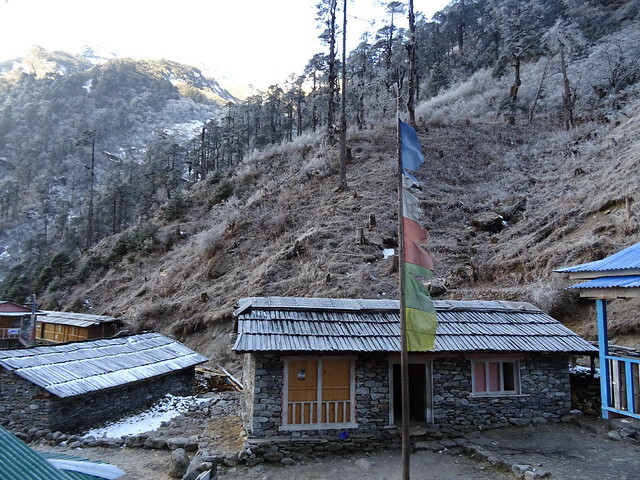 Its so cold outside the porters have joined us for tea, though its clear there’s a hierarchy, as Phenden our Sirdar is in the kitchen near the stove with the lodge owner while the rest of the team huddle around the small stove in the dining area. 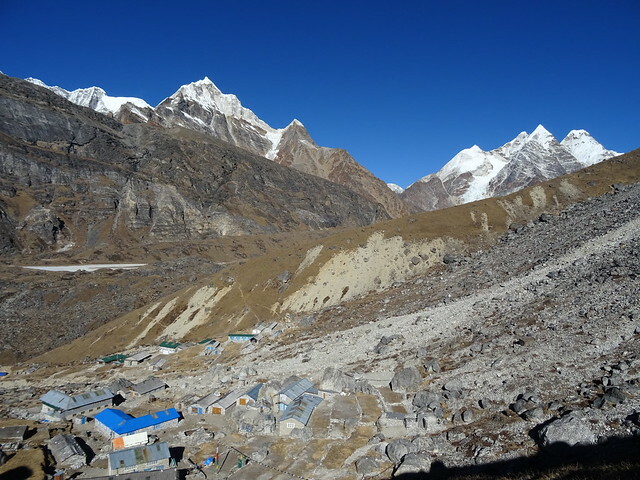 We are planning to stay here for one more night to acclimatise. 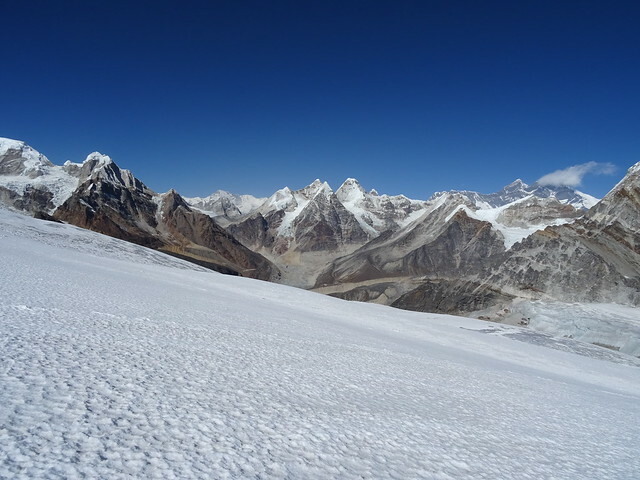 I didn’t sleep well at Thule Kharka, mostly due to my cold, but we were also at 4320m so I think being so high so quick must have had an impact too and my sinuses felt really tight. 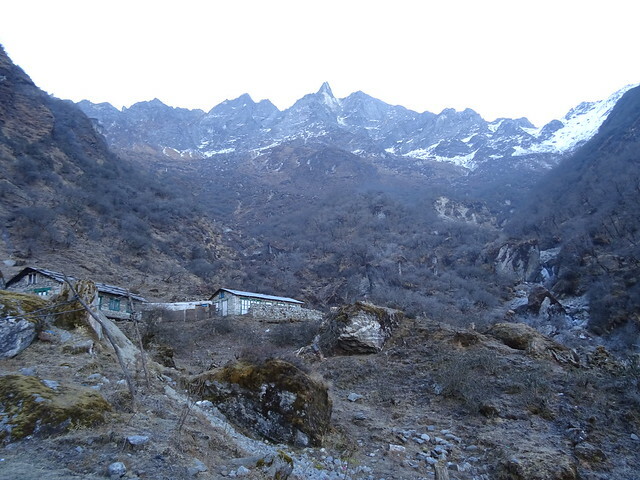 The trek to the loo in the night was not only cold but a long walk so I could certainly feel my head throbbing, which meant I hadn’t drunk enough water before going to bed and so the altitude was getting to me. Heading out in the cold was worth it though, the stars in the clear sky were amazing, and I even saw a shooting star. Magical, even with a throbbing head. 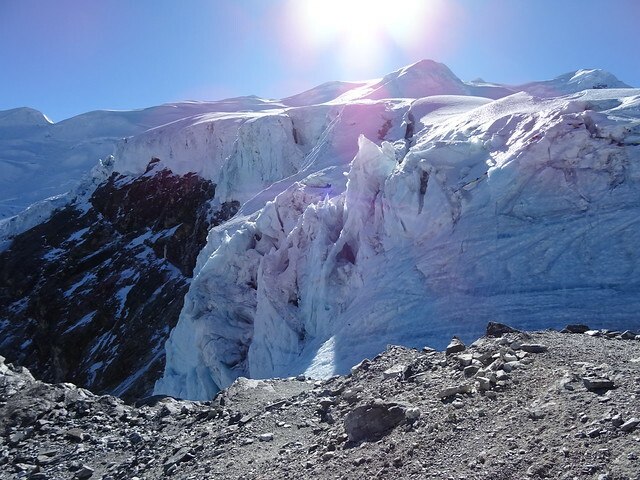 We left Thule Kharka at 8.30am with the sun shining, it was like a gorgeous alpine day with the snow on the ground. 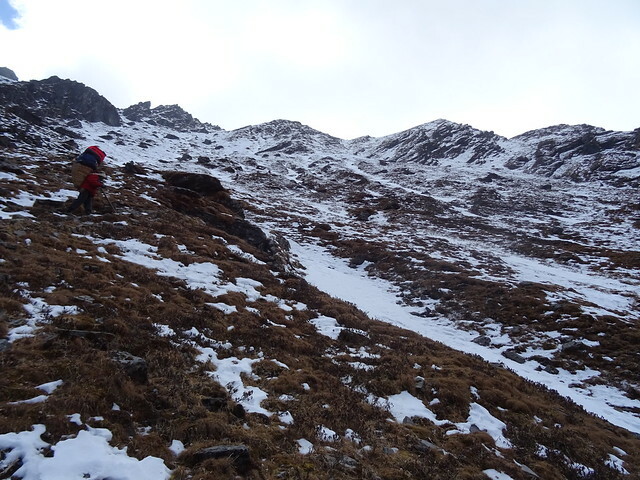 The route took us around the side of the mountain over three small passes, which were fun to scramble up in the snow which had collected in the gulleys. 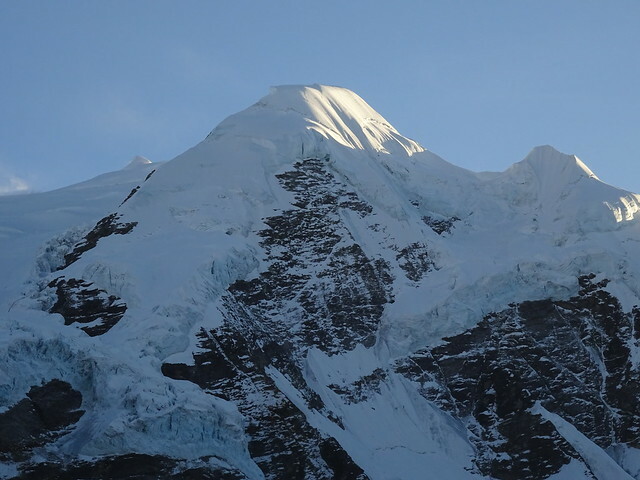 At the last pass we finally got our first glimpse of Mera Peak – it’s massive! 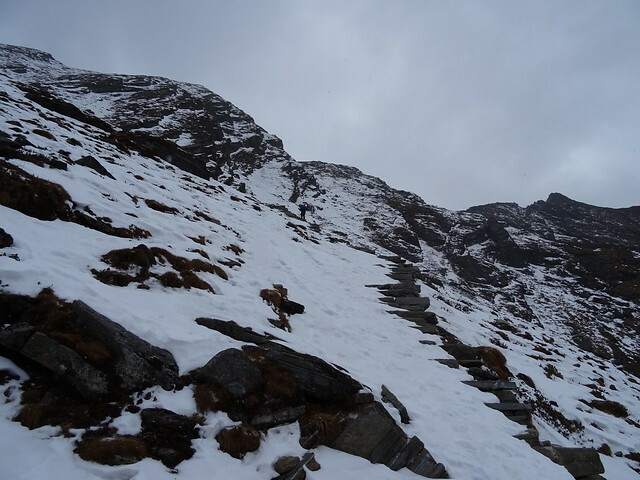 The route down the mountainside to reach Gotay zigzagged through the scrub and rhododendrons and in the snow it was fairly slippy going, so quite slow. 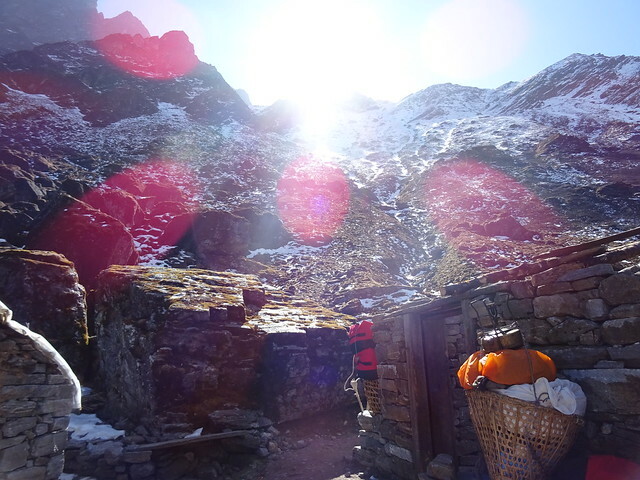 We stopped half way down at a small lodge to have packed lunch, soup and hot lemon in the sunshine. 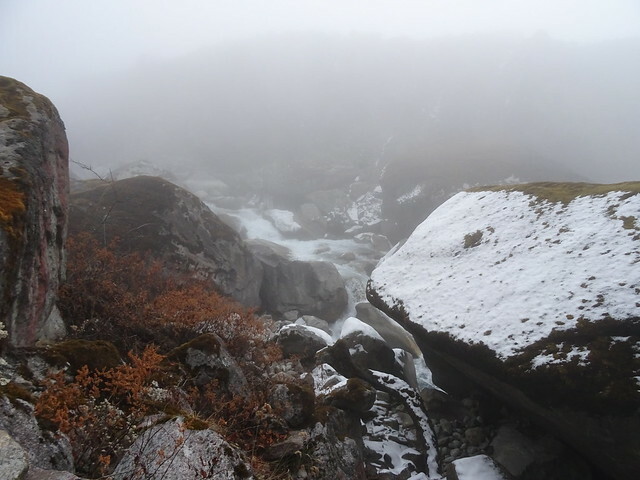 As we continued to head downwards into the woodland the mist had arisen from the valley floor and it was much colder. The path wasn’t entirely downhill as there were a few steep sections of uphill as we followed the river to Gotay, a sting in the tail of the day’s walk. Out of the woodland the valley is really barren, caused by a flood in the upper Hinku Valley in 1998 – you can see where the flood ripped out the side of the valley wall, permanently scarring the landscape. 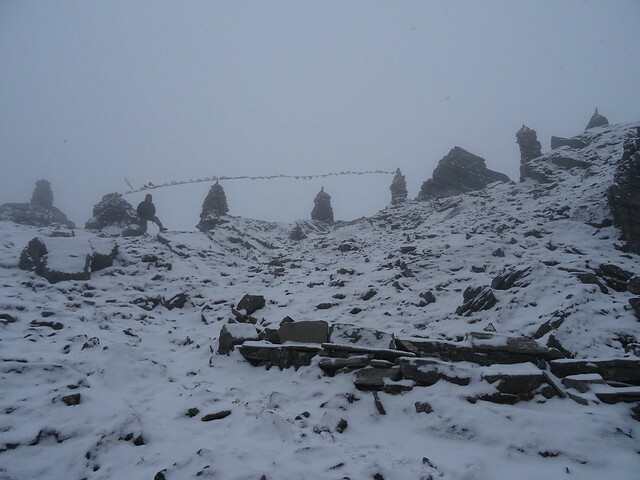 Gotay seemed eerie – its a large collection of lodges as this is the main meeting point of two routes to Mera Peak – the other route coming around the mountainside rather than over the Zatrwa La pass. 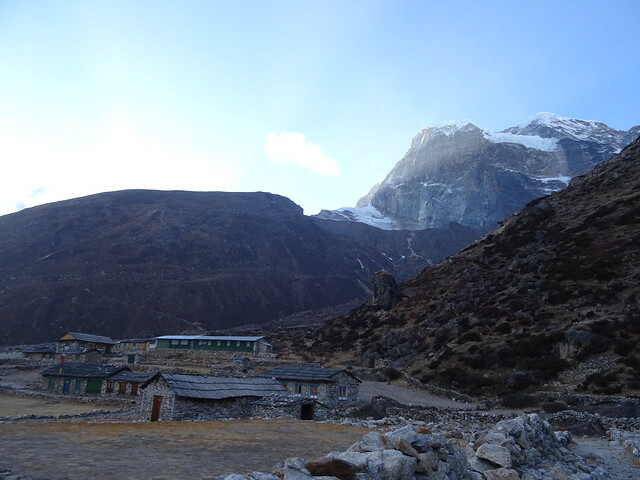 But in December the lodges are all shut and we’re the only ones here – with one lodge opened specially for us. At least my sinuses aren’t as sore here, and I’ve been able to blow my nose properly. 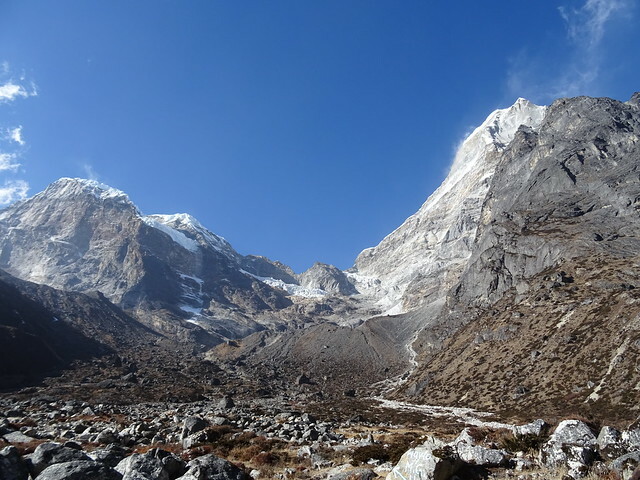 Only 4 days into the trek and my nose is already really sore from blowing it – its not going to look pretty by the end of the trek! 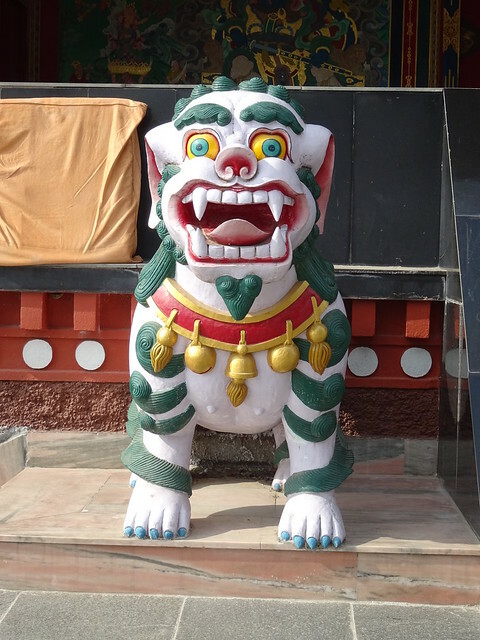 Having woken with headache from a cold I acquired in Kathmandu I needed a good dose of decongestants this morning before we headed off. 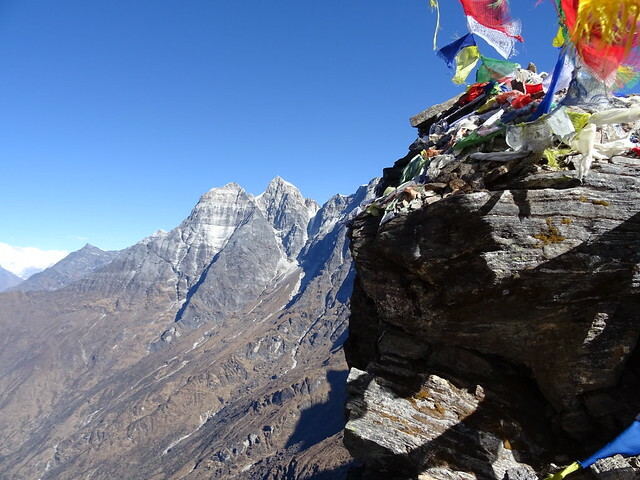 I’m glad I’ve been drinking lots of fluid so its not an altitude headache. 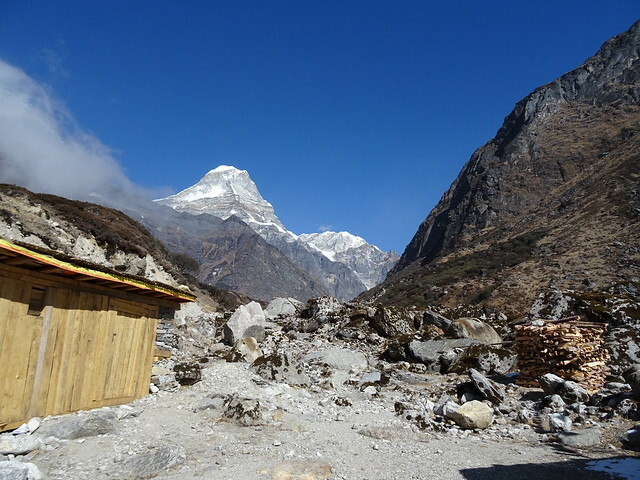 We left Chutanga at 8.30am and slowly headed up the mountain side, stopping at the huts we went to yesterday. 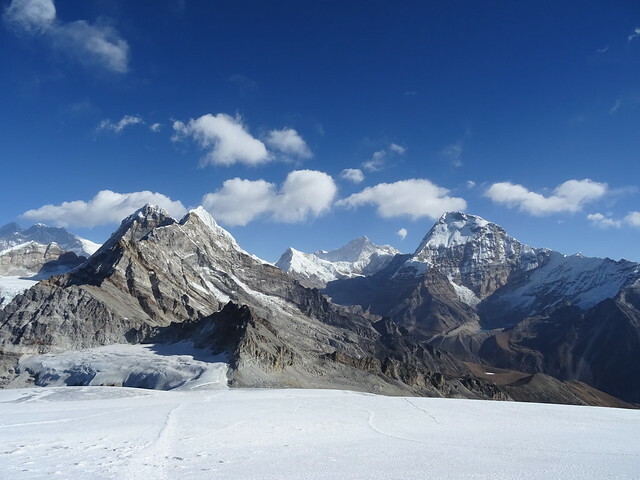 We’d been given packed lunches today- boiled eggs, Tibetan bread, biscuits and chocolate – so since we were at 4000m I made sure I stuffed some food in, anticipating little chance to as we headed higher. 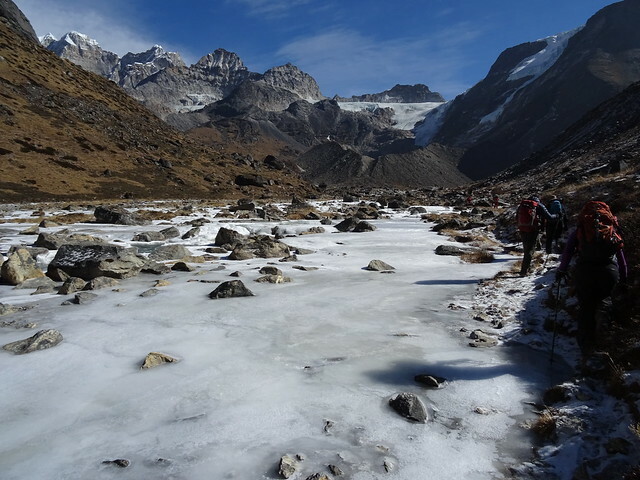 While we had been sat in the sunshine enjoying food and drinks, the route ahead was covered in snow and ice. 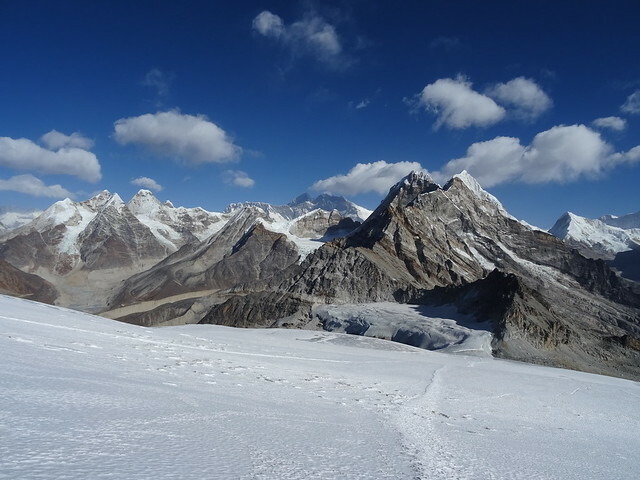 So with ice axes out, helmets and spider crampons on we headed up the route where our climbing Sherpas Thile and Pembe had been cutting steps in the ice. 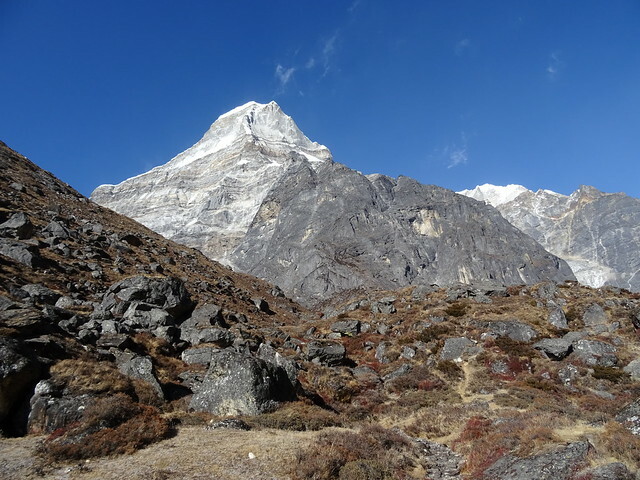 Whilst it was steep going it reminded me of a good day out in Scotland in the snow and sunshine, more so when it then started to snow as we got closer to the top of the Zatrwa Og – the first pass of the Kalo Himal ridge between the Khumbu and the Hinku valley. It hasn’t really stopped snowing since. 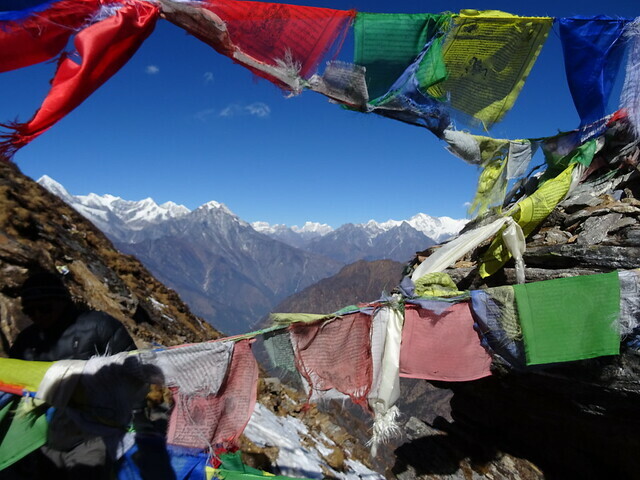 Once I reached the prayer flags at the Zatrwa Og I could certainly feel the effects of altitude, making progress slow. 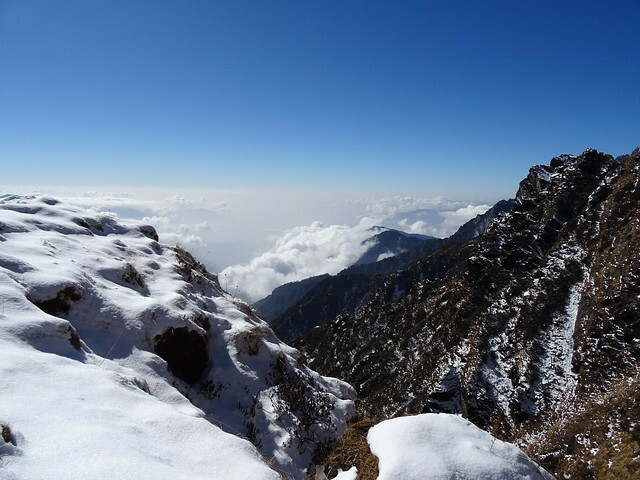 So while we had reached the Zatrwa Og at about 1.30pm it was 3pm before we traversed around the mountain top to the final high point of the Zatrwa La. 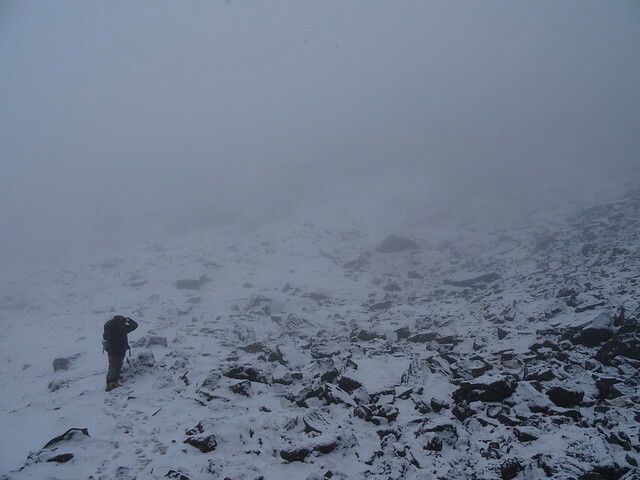 Slow due to the wind and poor visibility in the snow, and not helped by the altitude. 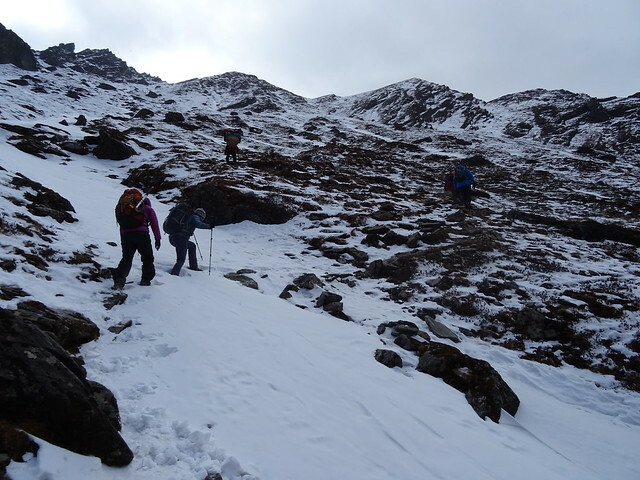 In the persistent snow our group split in two at different paces and while I was in the front group it was still painfully slow. 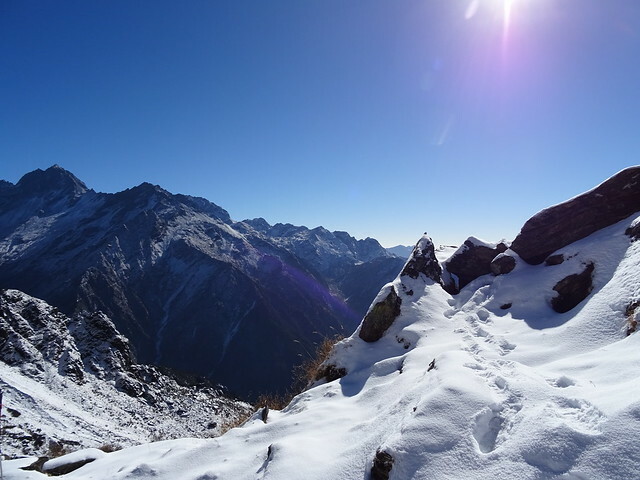 It would have been nice to celebrate reaching the Zatrwa La top at 4600m but it was freezing (my water bottle was completely frozen! 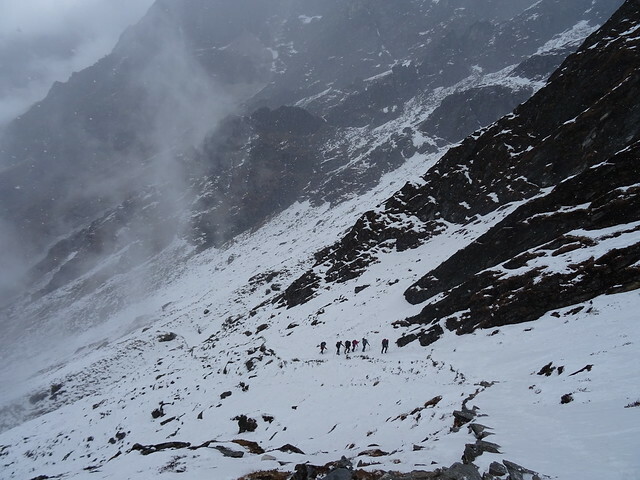 ), and it was preferable to keep moving to descend to Tuli Kharka lodge at 4320m – making it there for 4.15pm. 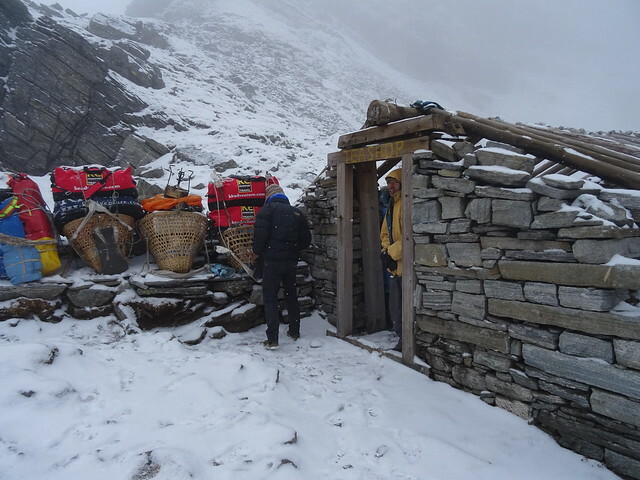 After the cold and snow today it was good that our porters joined us in front of the stove fire – they deserved it so much for battling on with no complaints despite most of them having only trainers on today and little warm clothing. I would not have survived today in their kit, but like heroes they get on with carrying heavy loads without protests. 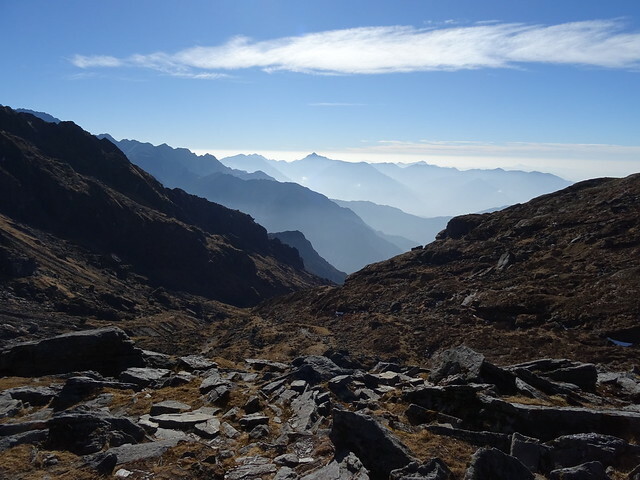 Mera Peak – day 2 – rest day? 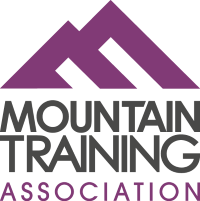 There’s no such thing as a rest day when climbing mountains or trekking, especially at altitude. Today has been no exception. I think I was the first to bed last night at 8.30pm and thankfully only had to get up once for a pee in the night. God it was cold! Pancakes for breakfast turned out to be just what I needed to get me fuelled for the day – even if it tasted smoky from the fire. 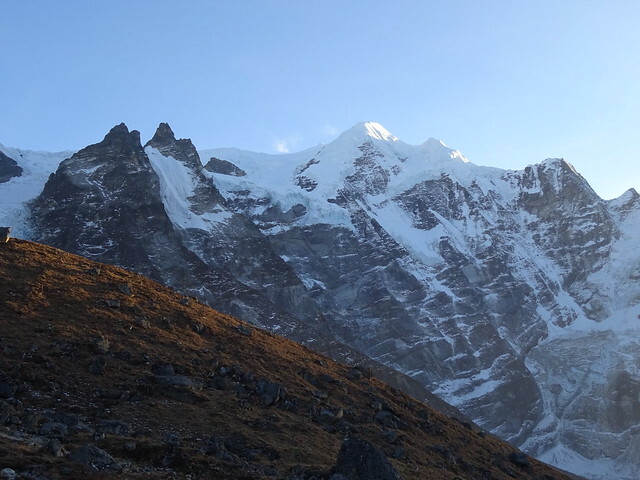 I also managed to drink a litre of tea and water before we set off and managed another litre during the day, which has certainly helped today with the altitude. 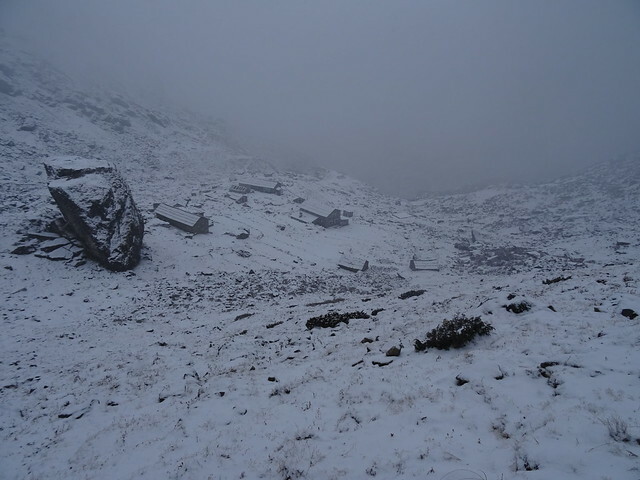 It was cold and frosty when we left Chutanga, walking half way up and along tomorrow’s route, towards the Zatrwa La pass. 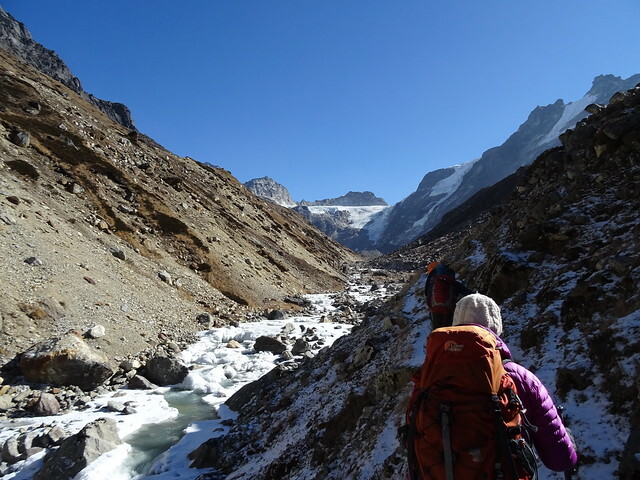 It’s been easy going at a nice slow pace and when the sun finally came out we stopped to take off our down jackets and appreciate the warmth. 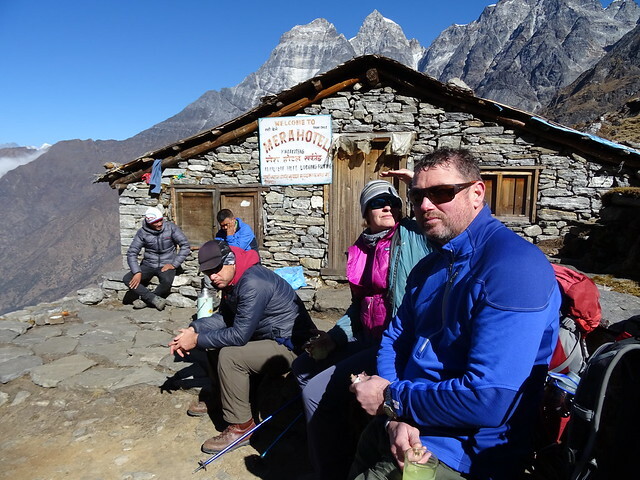 We reached the small huts at Kharkateng at around 4000m at 11.30am and it was nice to sit in the sun, drinking hot lemon and eating chocolate. 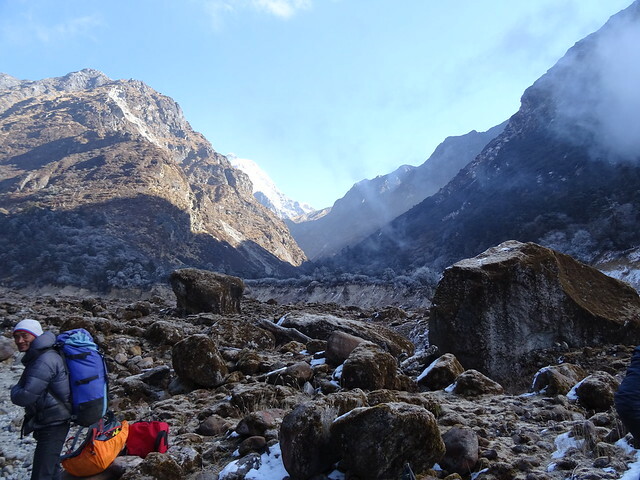 After a short break we headed back down to Chutanga to enjoy soup and more hot lemon in the sunshine. 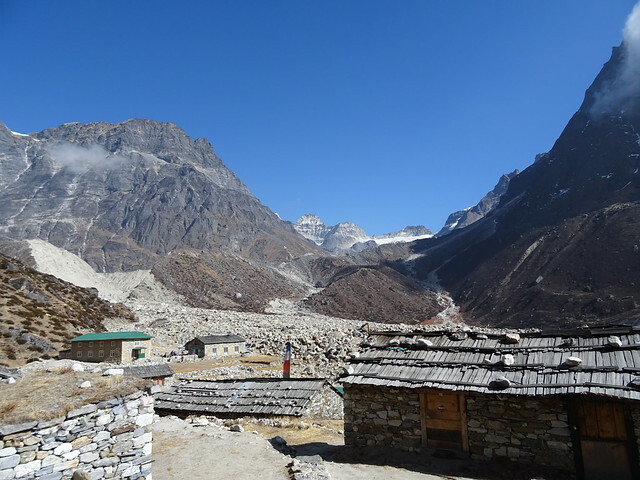 Having booked this trip as a camping expedition I’m grateful for the last minute decision by the company to use the lodges as it remains cold in the evening, and if we were in tents we’d be hidden away much earlier than our current bedtime of 8pm. 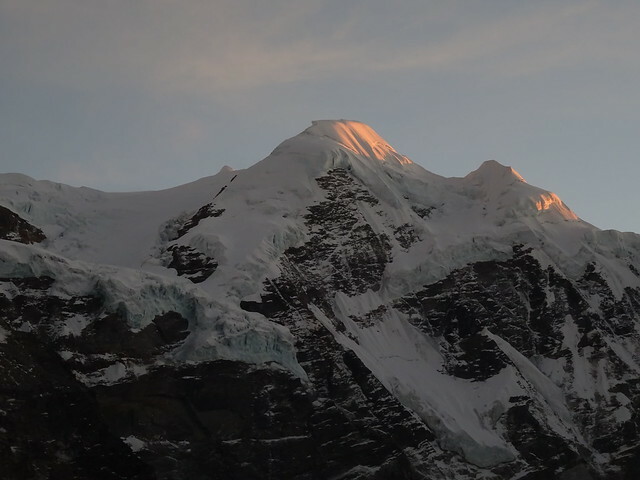 We’d be in our sleeping bags the minute the sun goes down at 5pm! It also means we are able to choose what we have to eat (albeit from a limited range) – but anything is better than having to eat whatever is served. Not that I’m fussy. 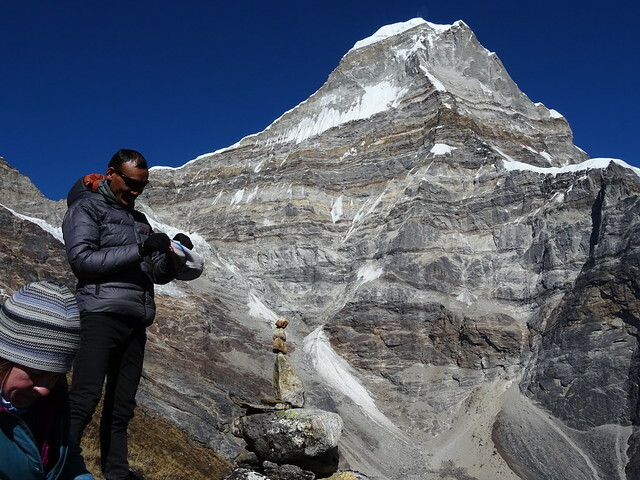 My appetite hasn’t disappeared yet from the altitude, but when it does being able to choose food will mean at least I eat something. Tonight my appetite is huge so I had soup and fried rice. Mmm. 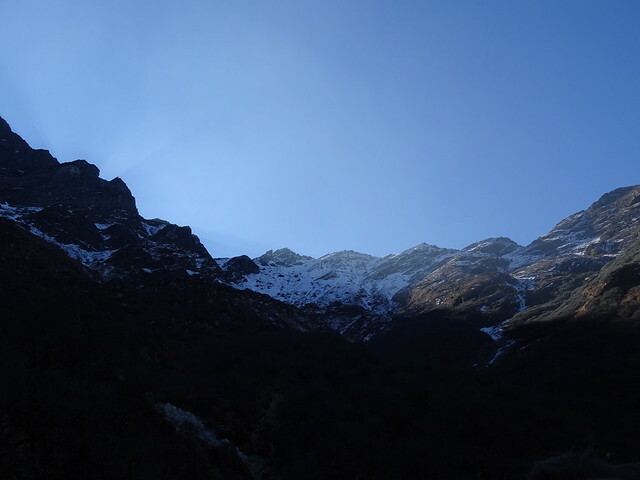 I’m already tucked up in my sleeping bag, and it’s certainly colder tonight as the sky is clear, though the stars are amazing set against the faint outline of the snowy mountains and the Zatrwa Og pass which we cross tomorrow.